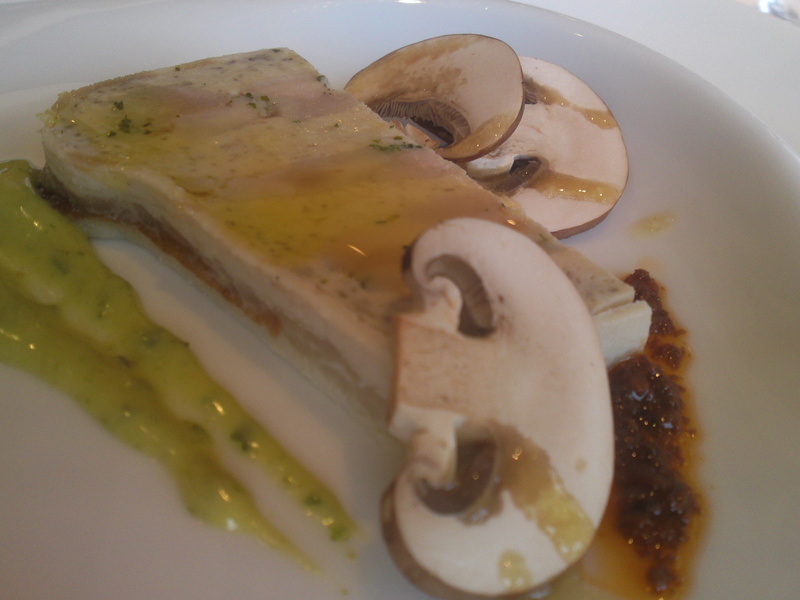 French Gastronomy: Local products at Restaurant Bio-S in Fujinomiya City! 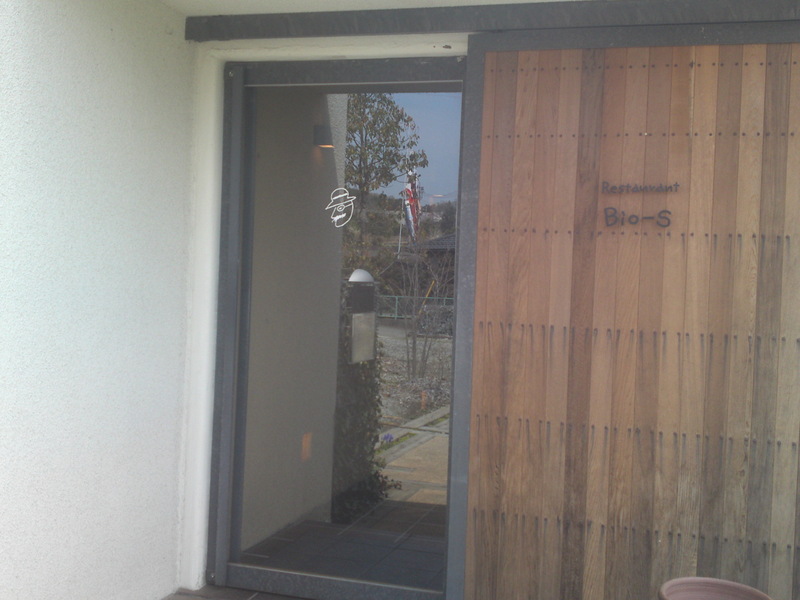 It has been a long time I have wished to visit Restaurant Bio-S in Fujinomiya City at the foot of Mount Fuji although it has been opened only 3 years! 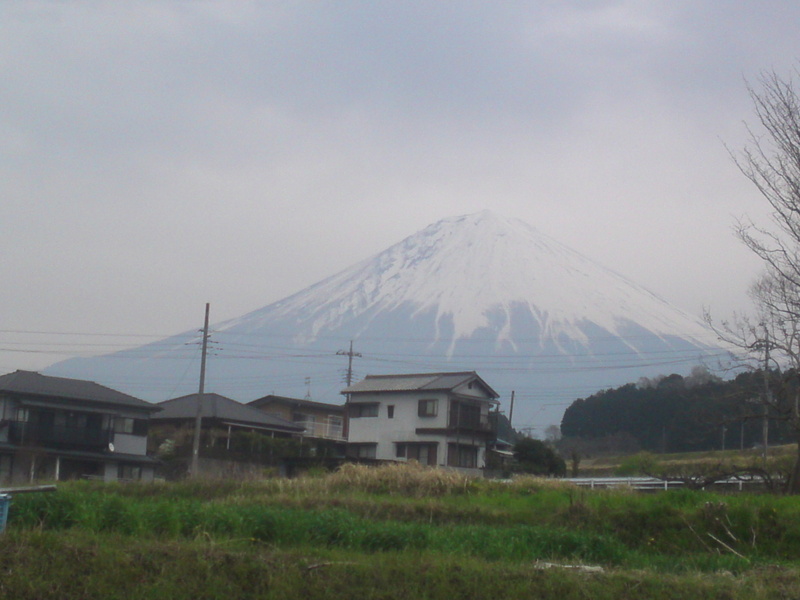 Even in overcast weather it is such a pleasure to work or eat under the benign protection of Mount Fuji! 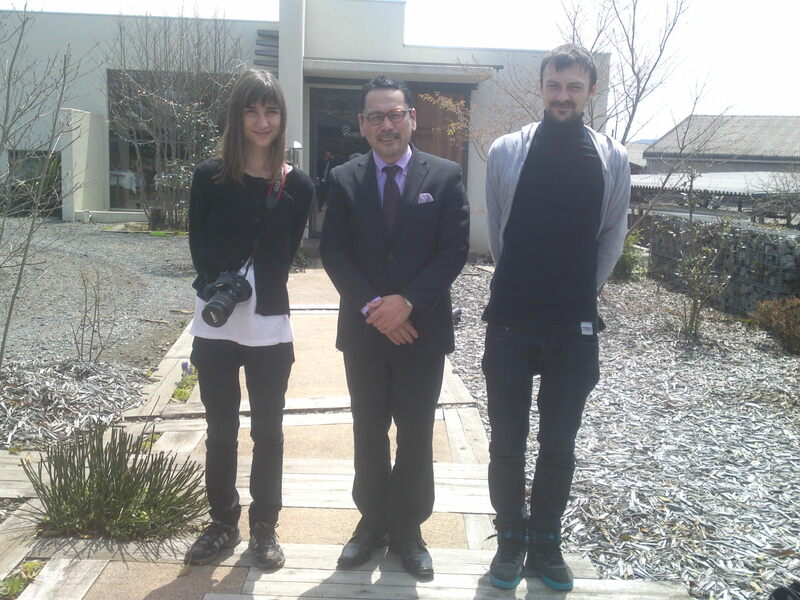 I finally had the occasion yesterday as I accompanied two new friends of mine, Camille Oger and Julien Morello from Antibes, France, and both journalists on a grand tour of Japan, here above standing on both sides of Mr. Kazuhiro Matsuki/松木一浩, the founder and owner of Bio Farm Matsuki, Restaurant Bio-S, Bio-Deli in Fujinomiya City and Comptoir de Bio-S in Shizuoka City! 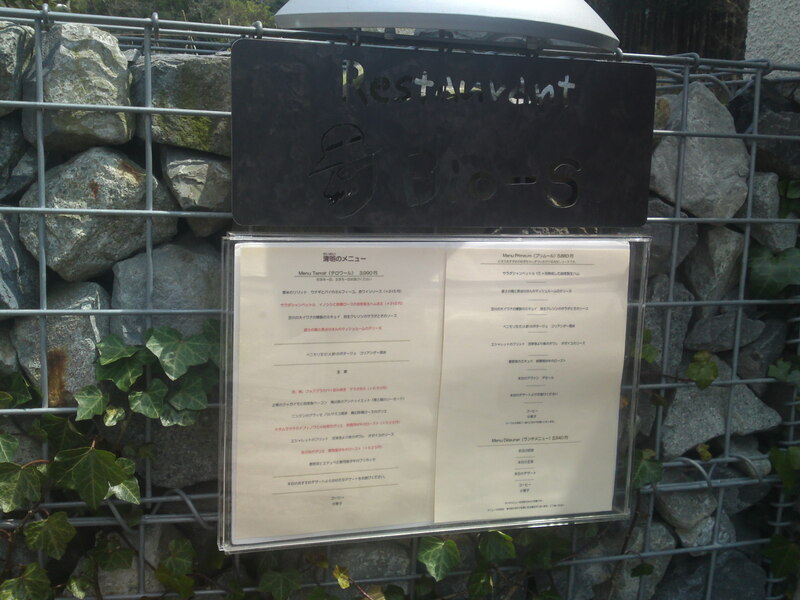 Menu posted outside as in France. 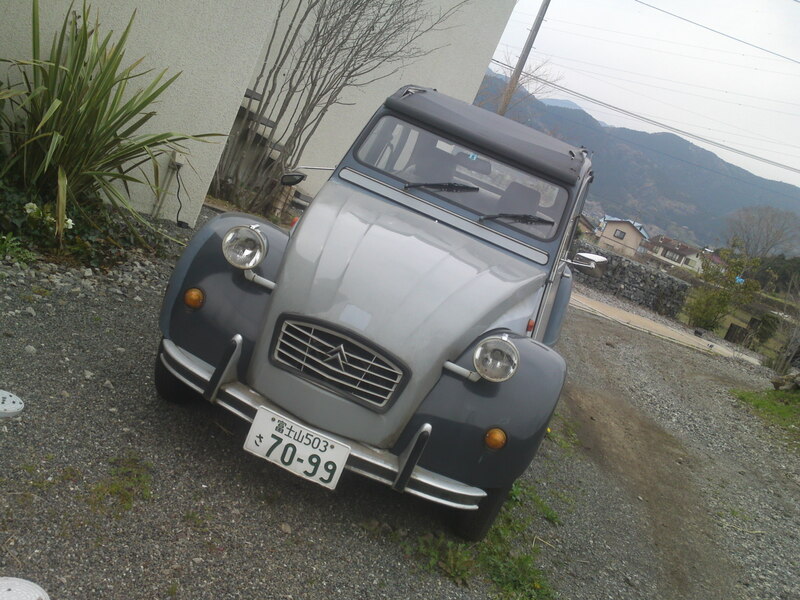 Kazuhiro Matsuki, originally from Nagasaki, Kyushu Island, worked for two years (he speaks great French!) 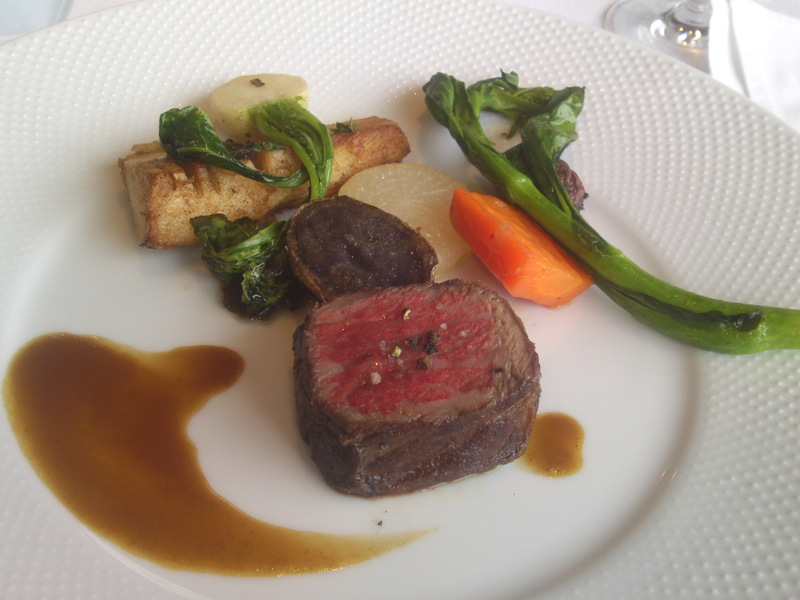 at Hotel Nikko, Paris, before he moved to Shizuoka Prefecture (his wife’s family lives in Shizuoka City) in Fujinomiya City to start the cultivation of organic vegetables in 2000. 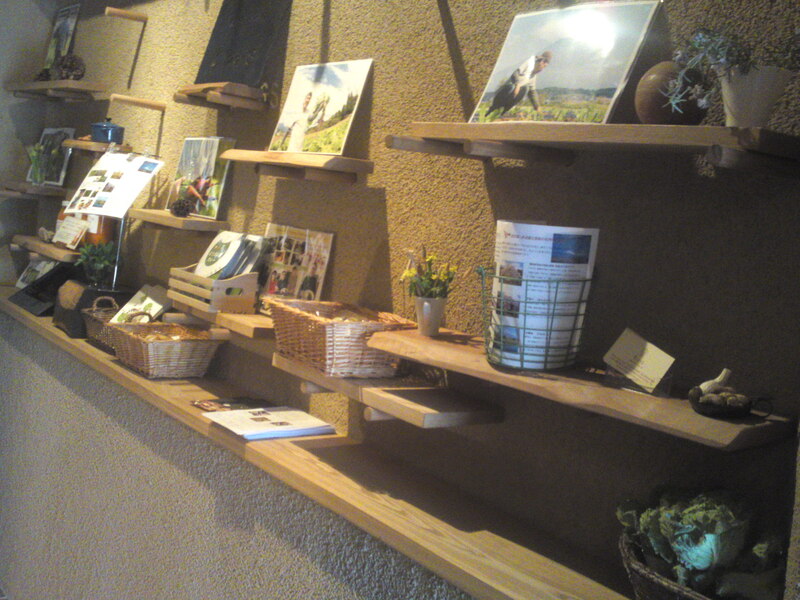 In 2009 he opened Restaurant Bio-s to promote organic cuisine. 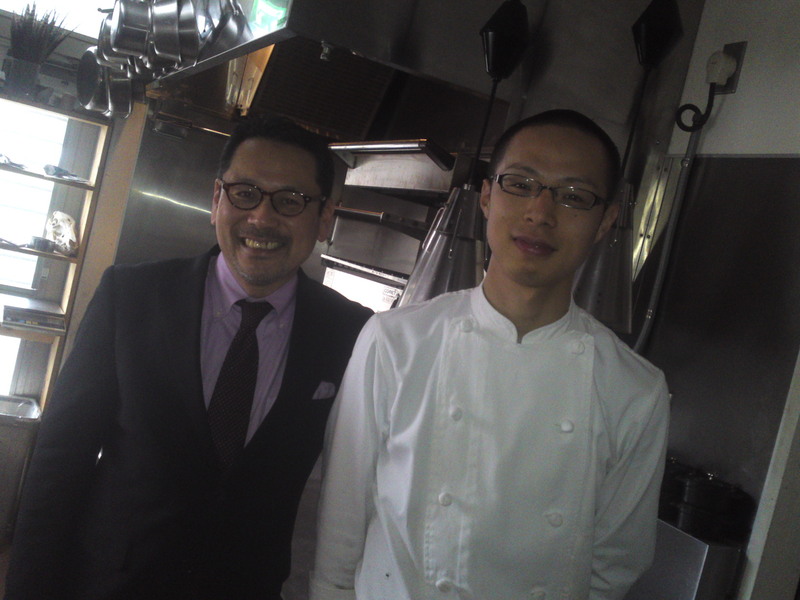 Mr. Kazuhiro Matsuki and his young talented chef (also a hunter!) 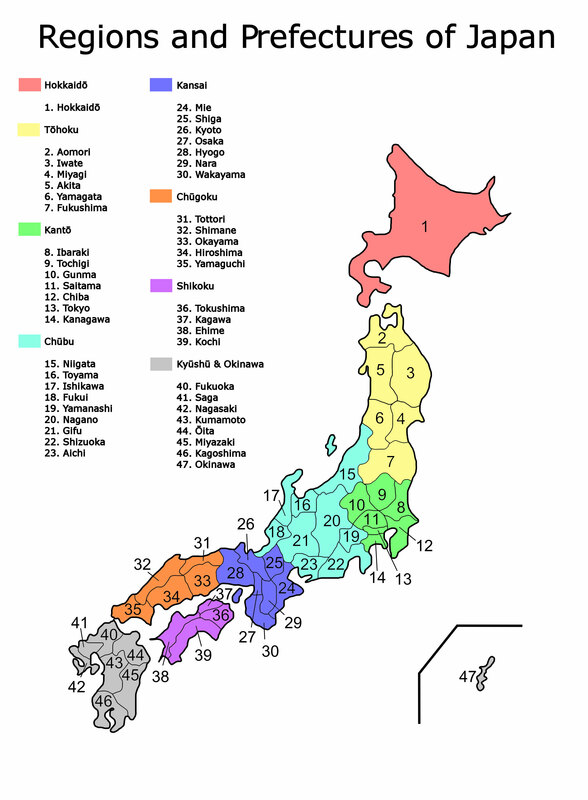 Mr. Yoshinori Kawasaki/川崎芳範 (born in Hyogo Prefecture!)! 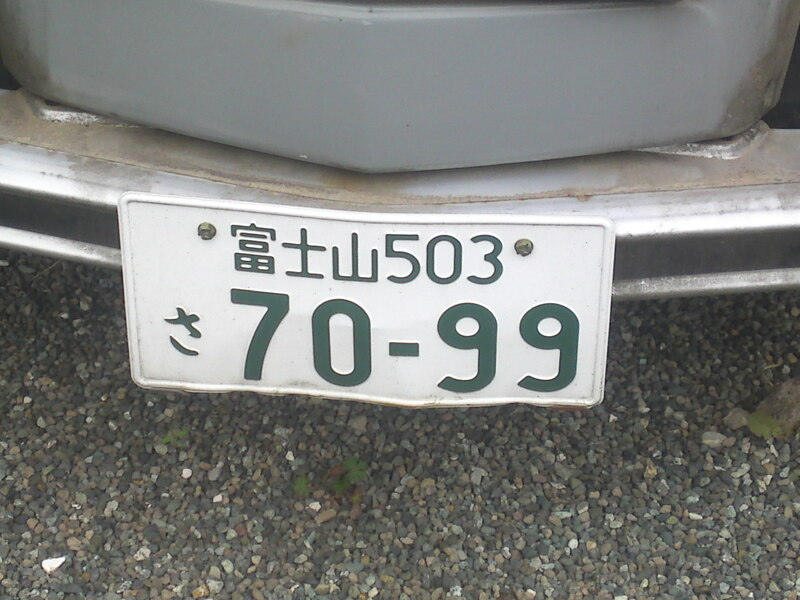 With a plate registered in Fujisan/富士山/Mount Fuji! 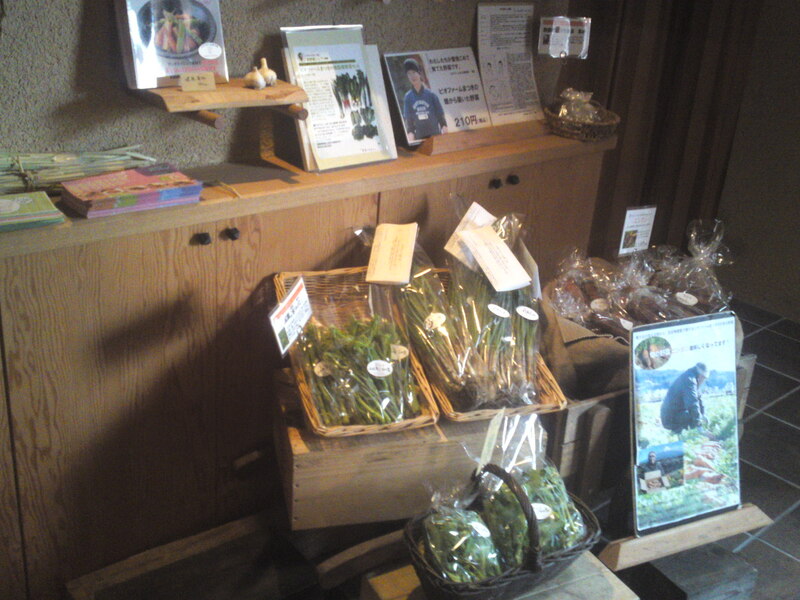 Bio Farm organic vegetables on sale in the entrance hall! 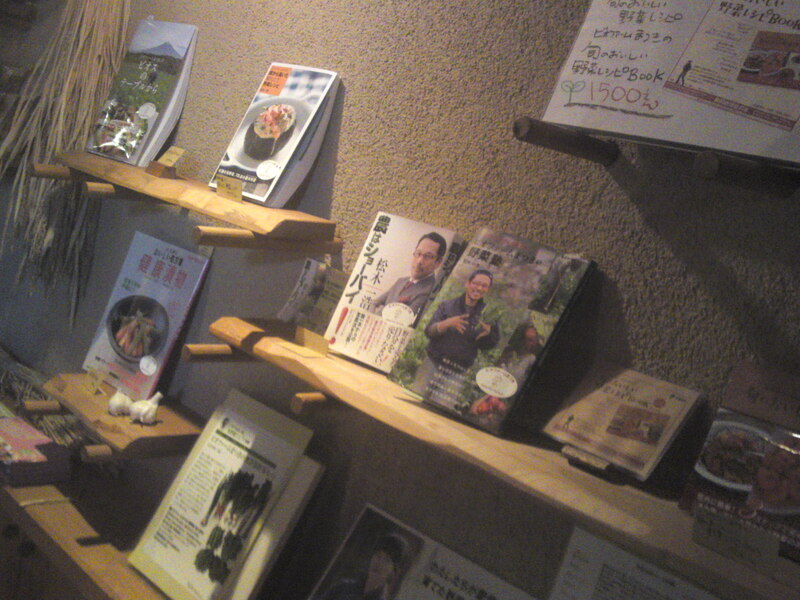 Mr. Matsuki is famous all over the country, what with the many books he wrote on organic farming and cuisine! 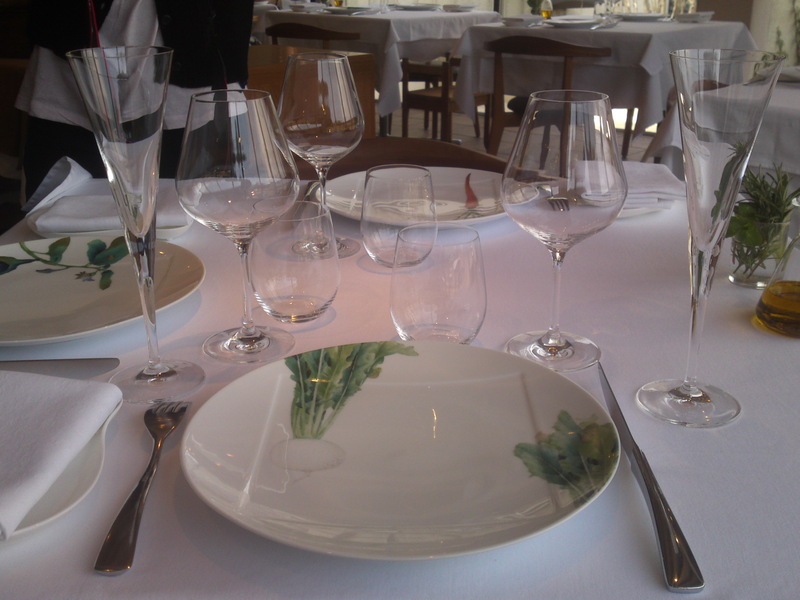 The table the three of us sat at for a great degustation lunch! 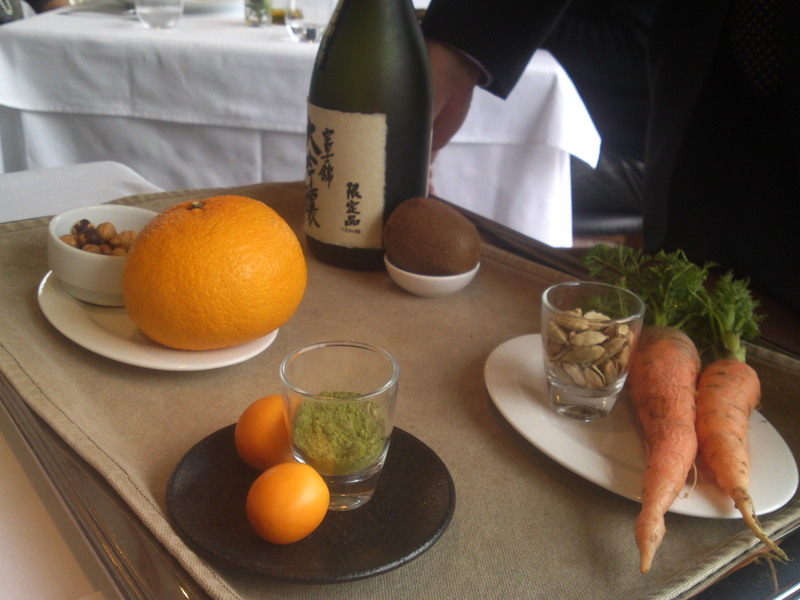 Offered by Mr. Matsuki who wanted to thank us for coming all the way! 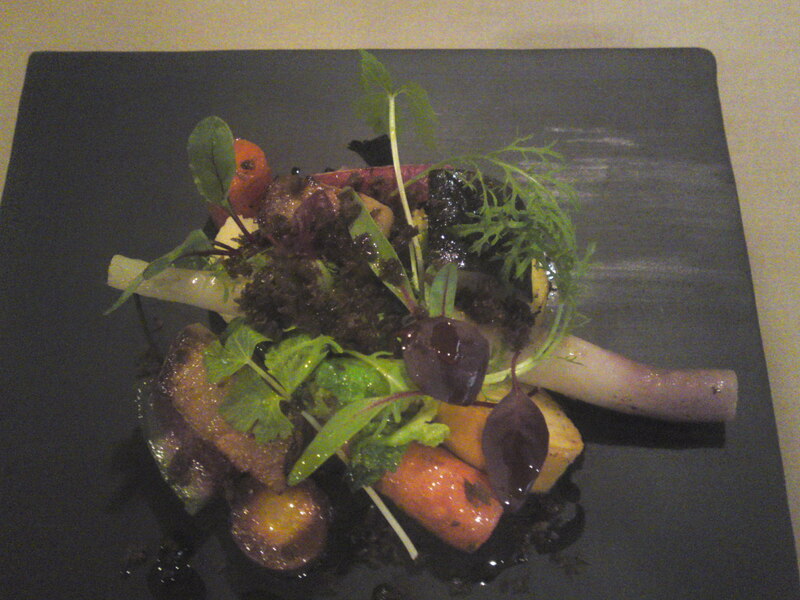 Of course vegetables at a premium! 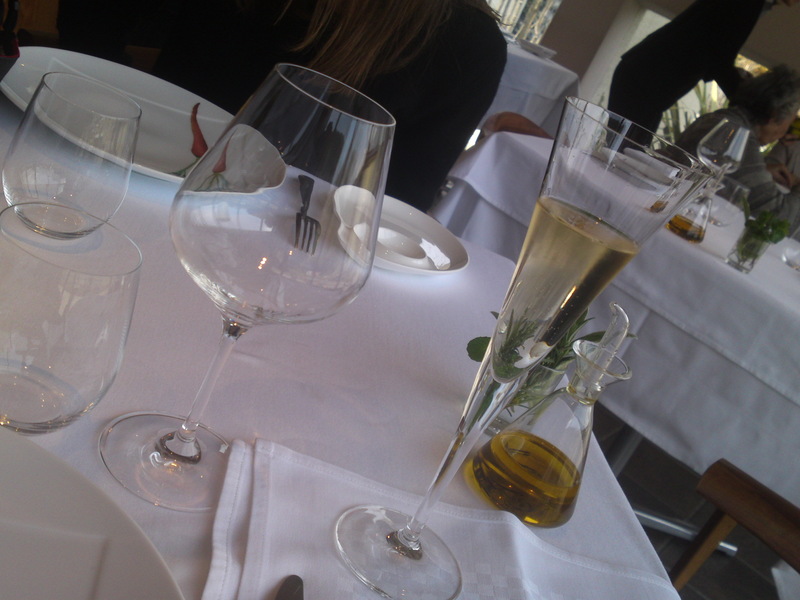 Now, what did we savor? 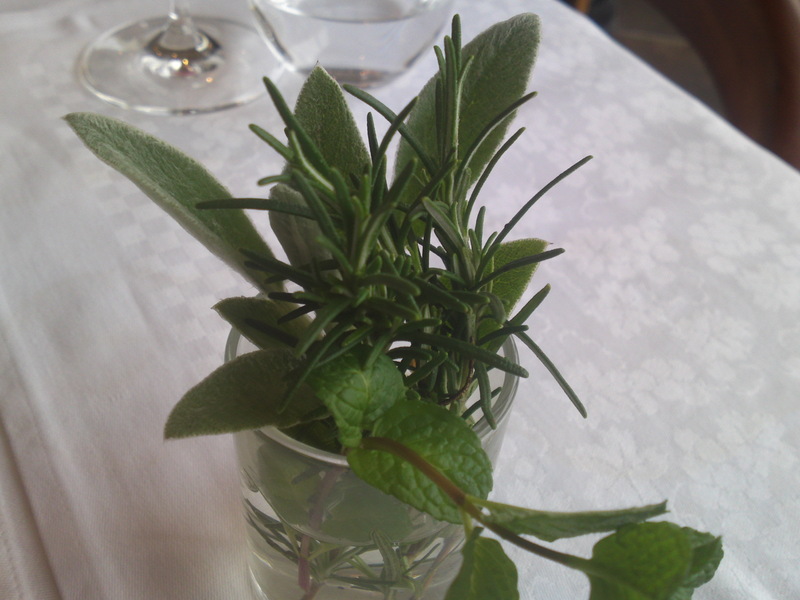 This sage, mint and rosemary are organic and for decoration, but you are encouraged to taste them! 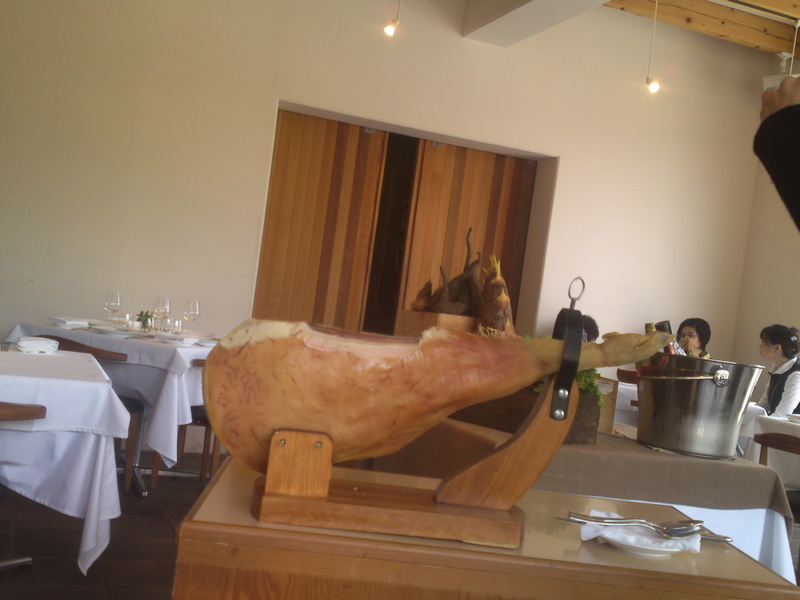 The legs of ham are imported from Spain but matured on site! 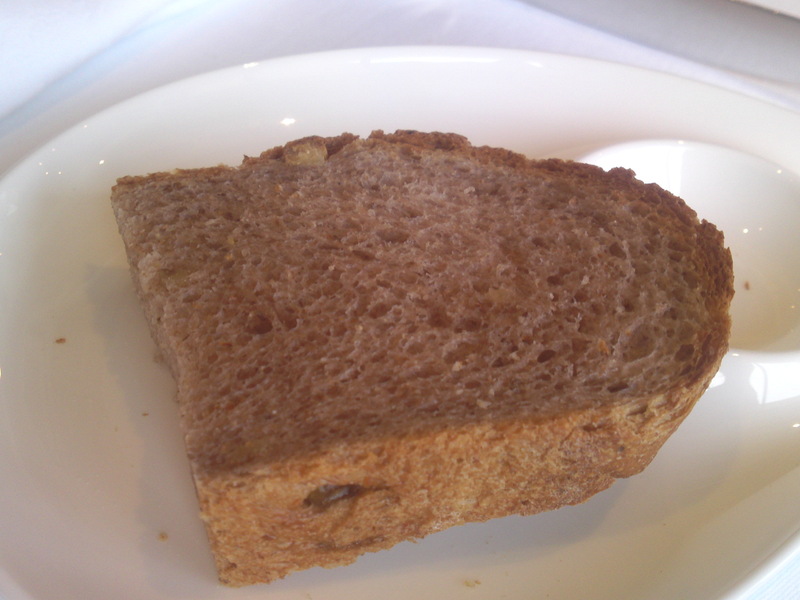 Mr. Matsuki cut ours in person! 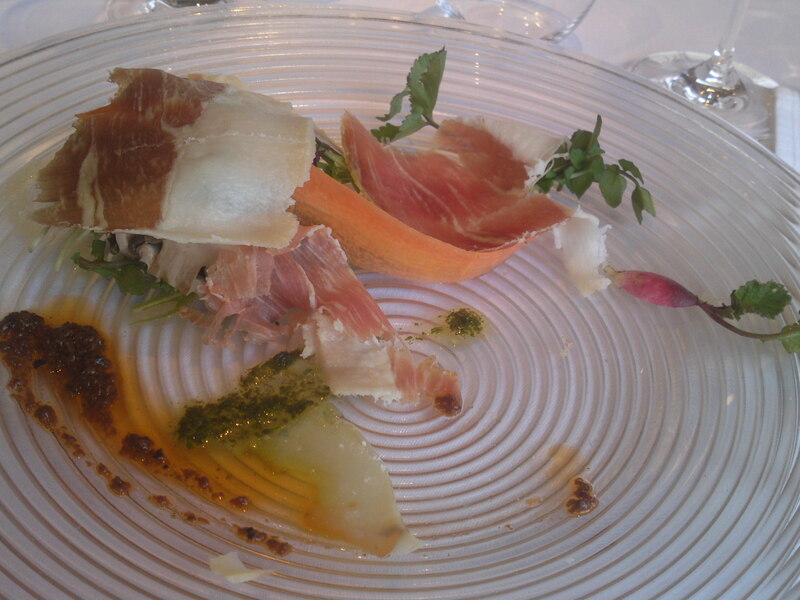 Raw ham on organic greens salad! 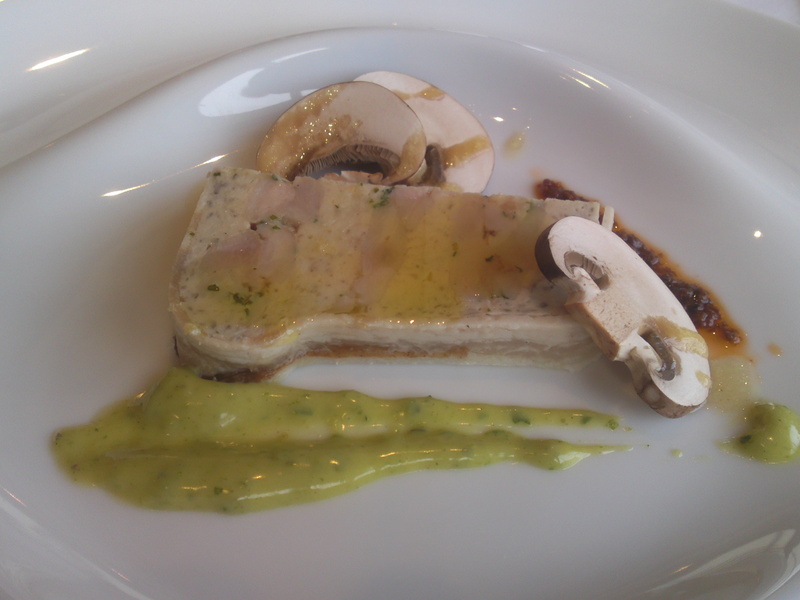 Chicken and mushrooms terrine! I did require a lot of patience to take the pictures before I could jump on it! 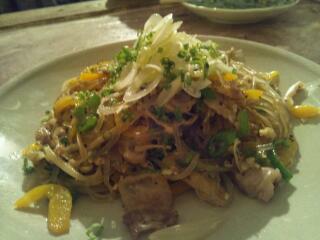 The chicken comes from Mr. Aoki’s Farm and the mushrooms from Mr. Hasegawa’s Farm, both in Fuji City! 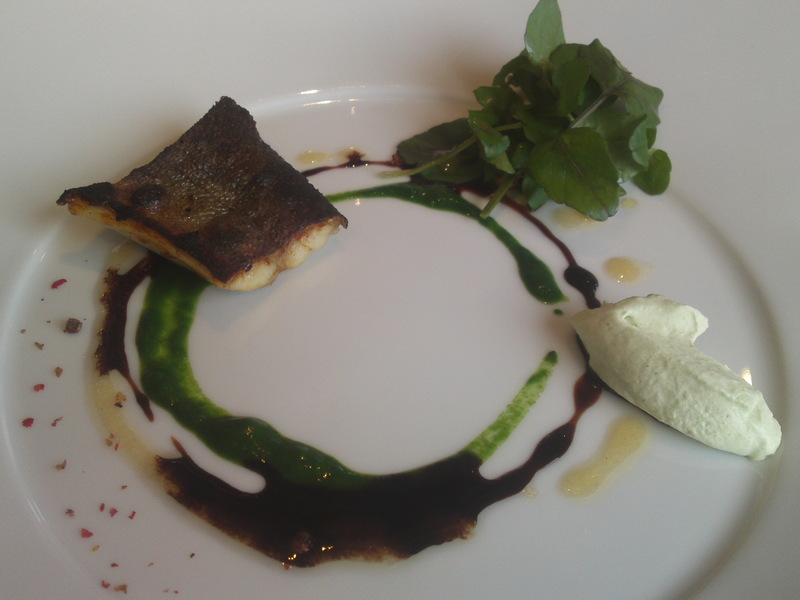 The first fish dish: Iwana/岩魚/Char/Charr/Salvelinus with cress sauce! 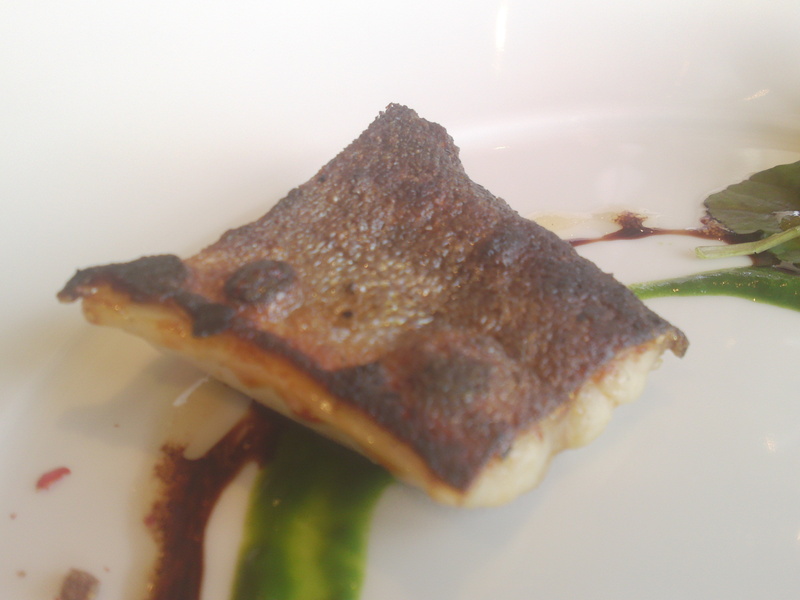 The char is bred by Mr. Iwamoto in Fujinomiya City and was lightly smoked before being sauteed/baked! 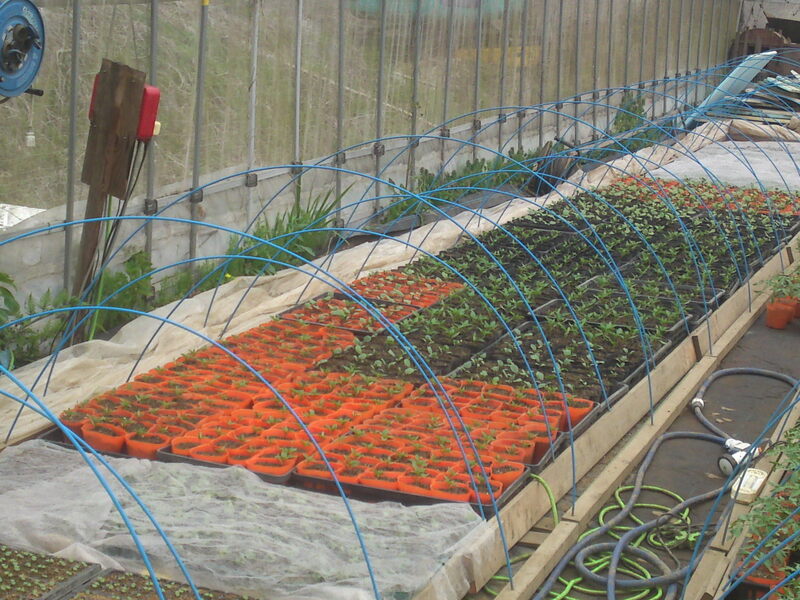 All the cress was picked in the wild along streams flowing down Mount Fuji! 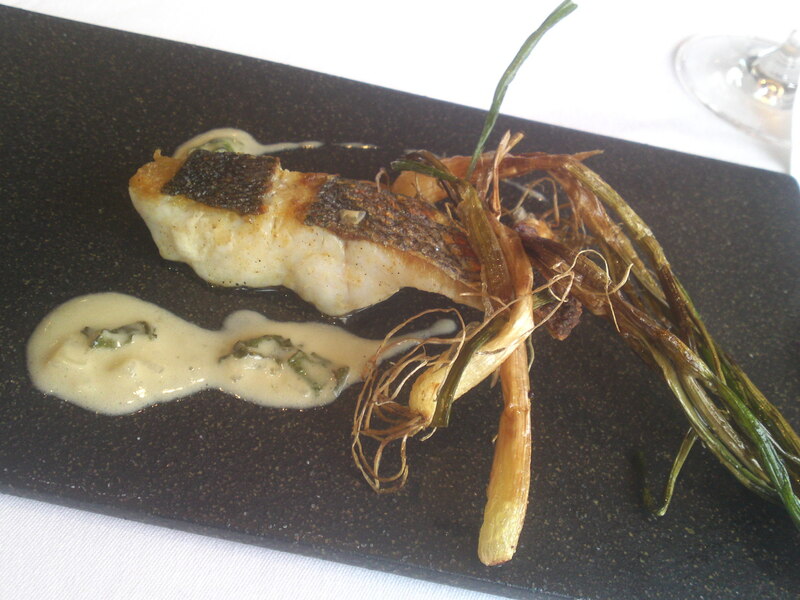 The second fish dish: Bass with Japanese echalottes! 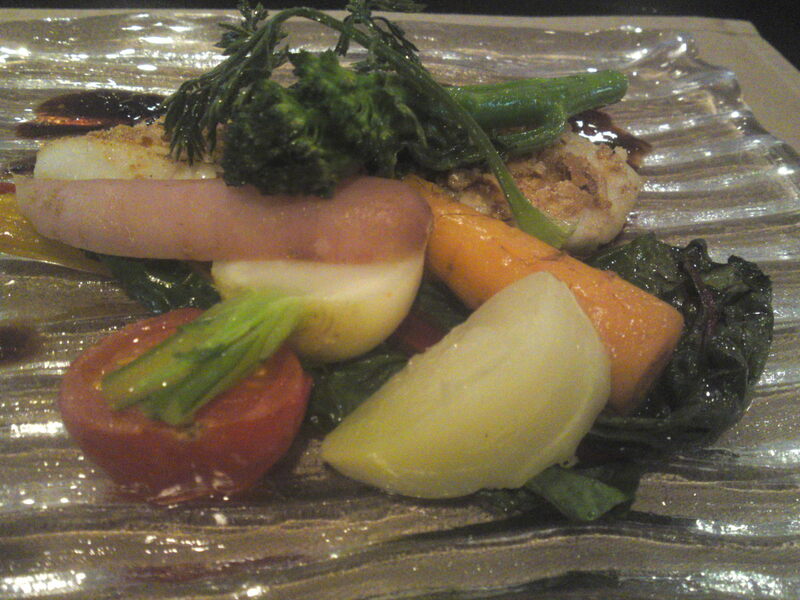 The bass was caught in Suruga Bay, Shizuoka Prefecture! 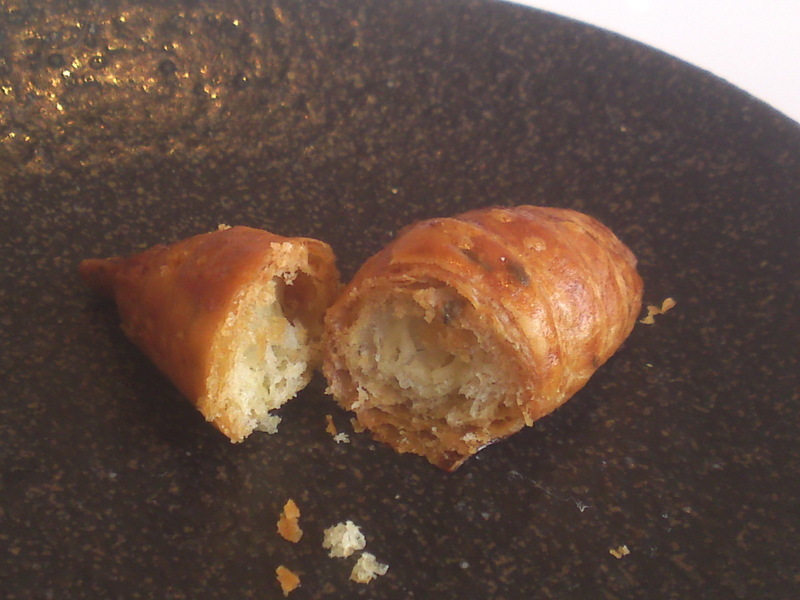 The Japanese echalottes baked to a crisp are grown organically in Bio Farm Matsuki! 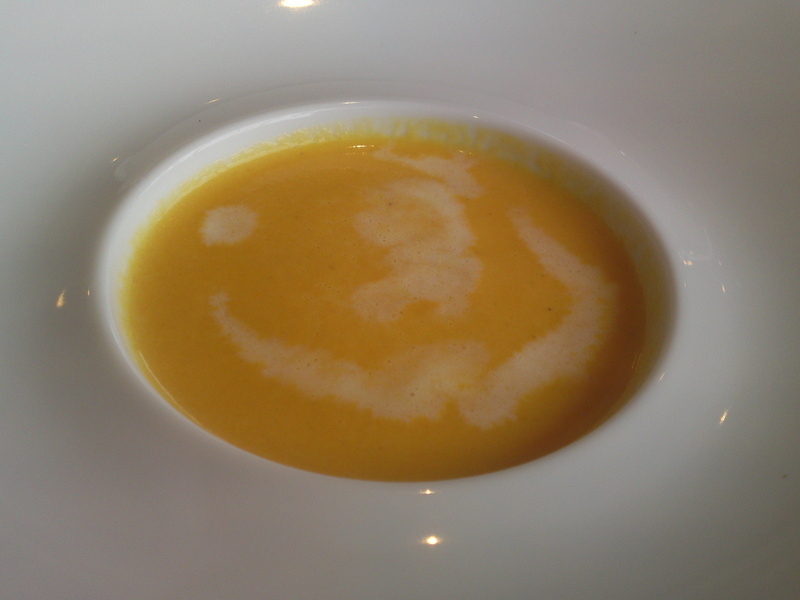 Before the meat dish we enjoyed a succulent organic carrot potage! 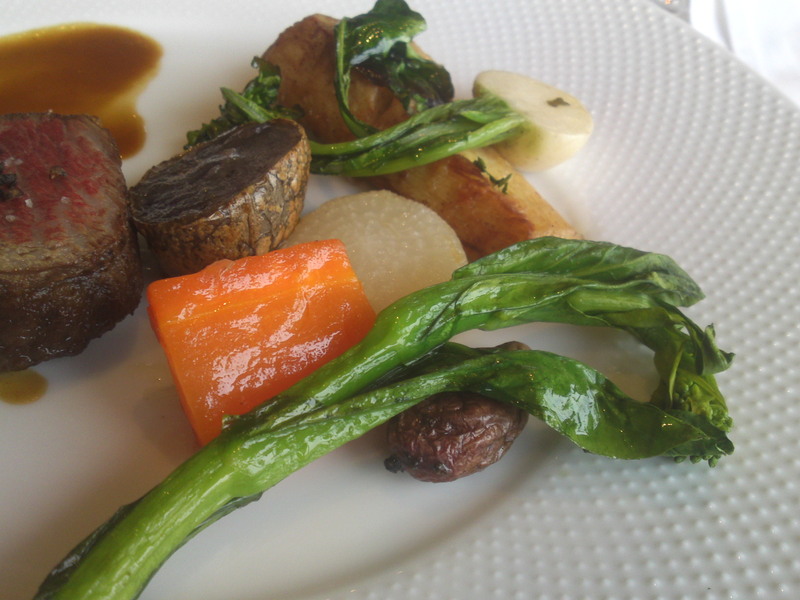 The meat dish: Fujisan Wagyu Beef from Mr. Okamura’s Ranch and organic vegetables from Bio Farm Matsuki! 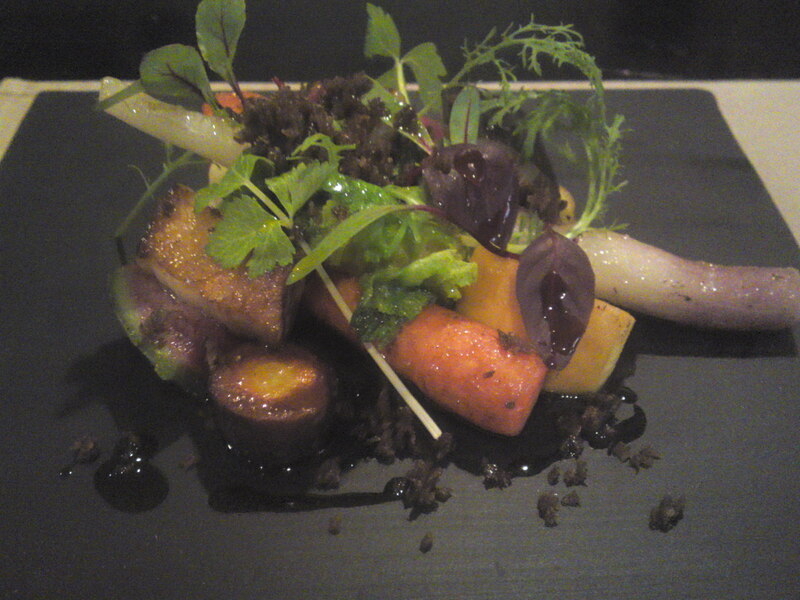 From another angle for a better view of the vegetables! 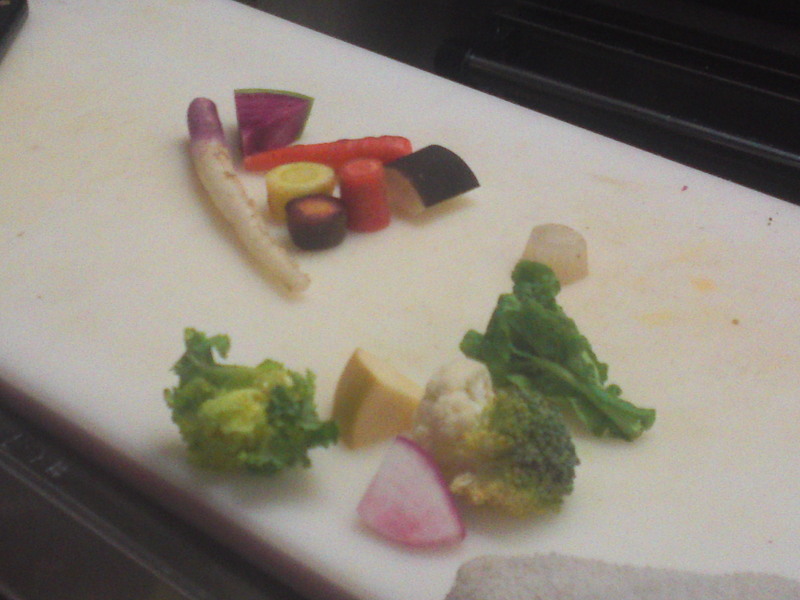 They included carrot, Red Moon potato, Broccolini, bamboo shoot, turnip, and daikon! 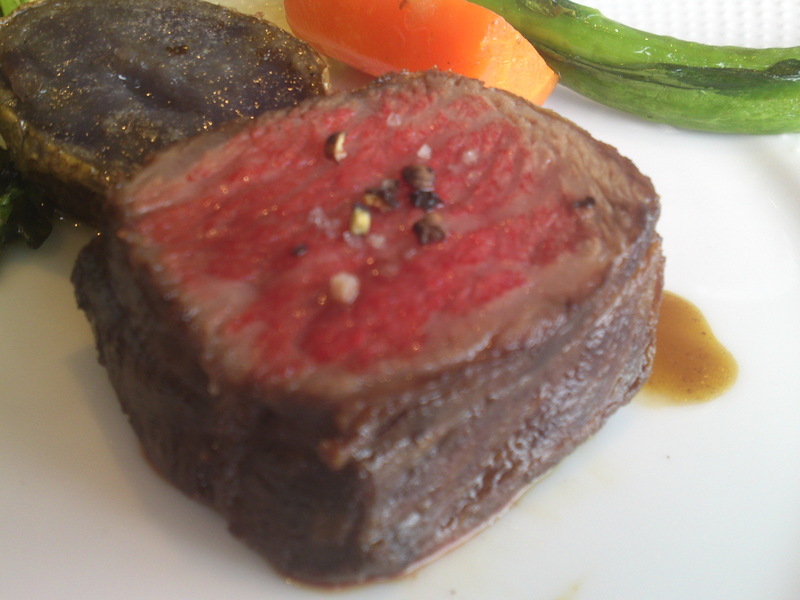 The piece de resistance: Fujisan Wagyu Beef which was awarded its title as Product of Shizuoka Prefecture in 2006! 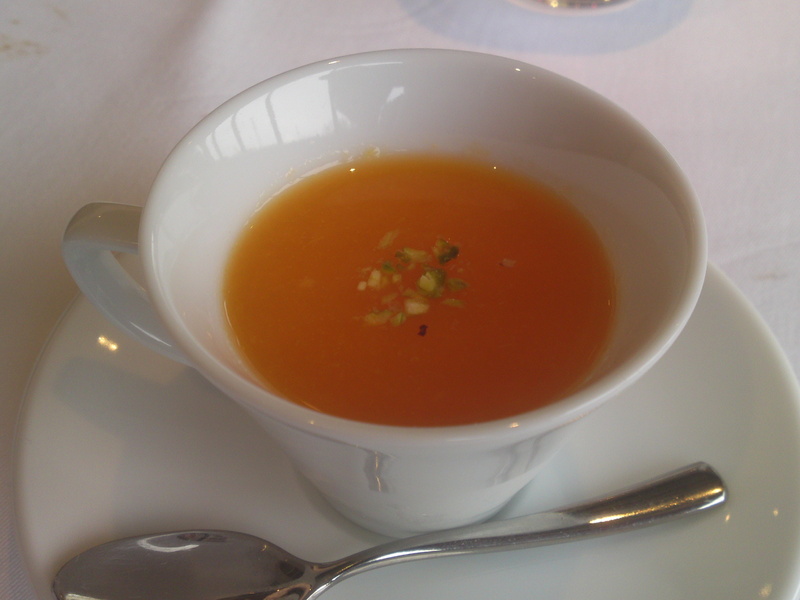 Before tackling the dessert we refreshed ourselves with this beautiful Suruga Elegant Orange Soup! 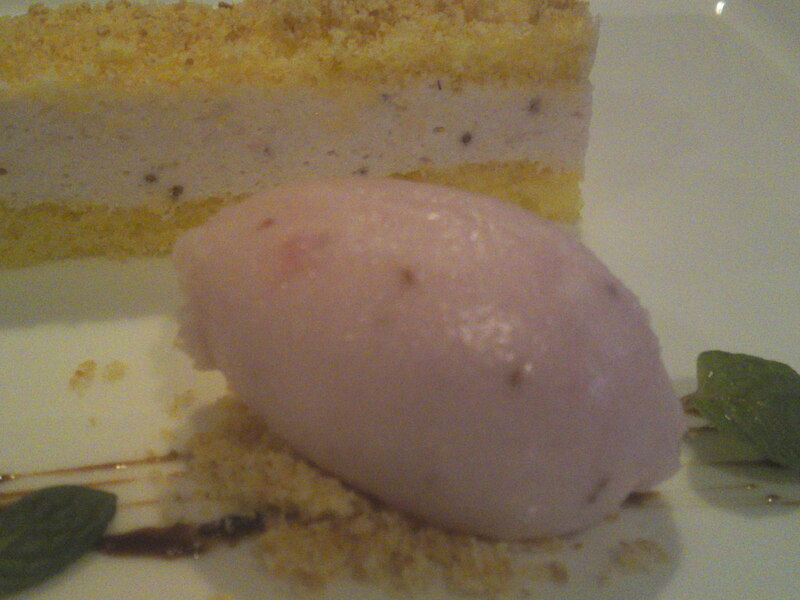 We were first shown the main ingredients of the four desserts! 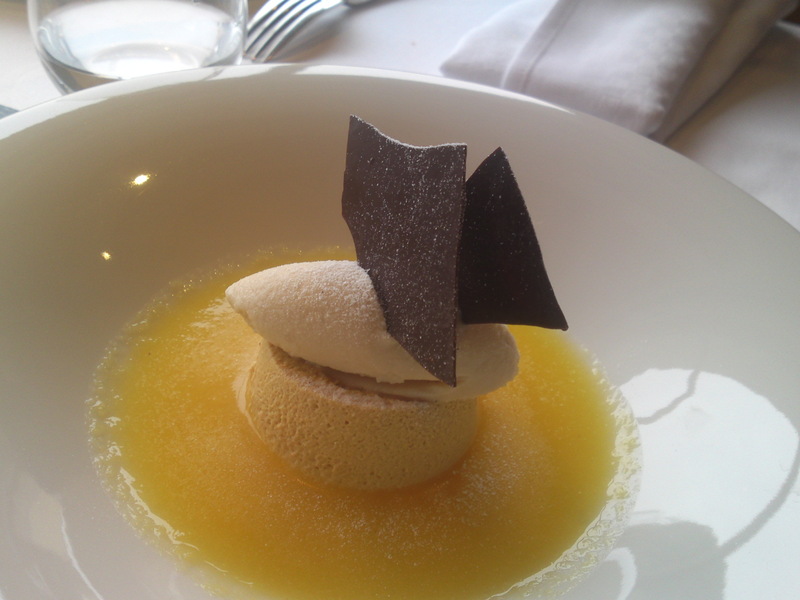 Suruga Elegant Orange Chilled Soup and Mousse topped with Hazelnut Sorbet and dark chocolate chips! 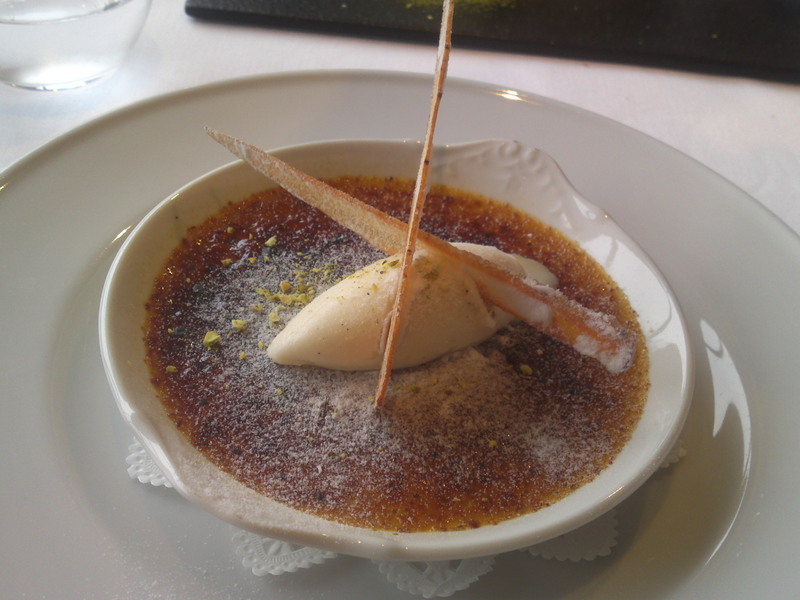 Organic Carrot Creme Brulee topped with Cardamon Sorbet! 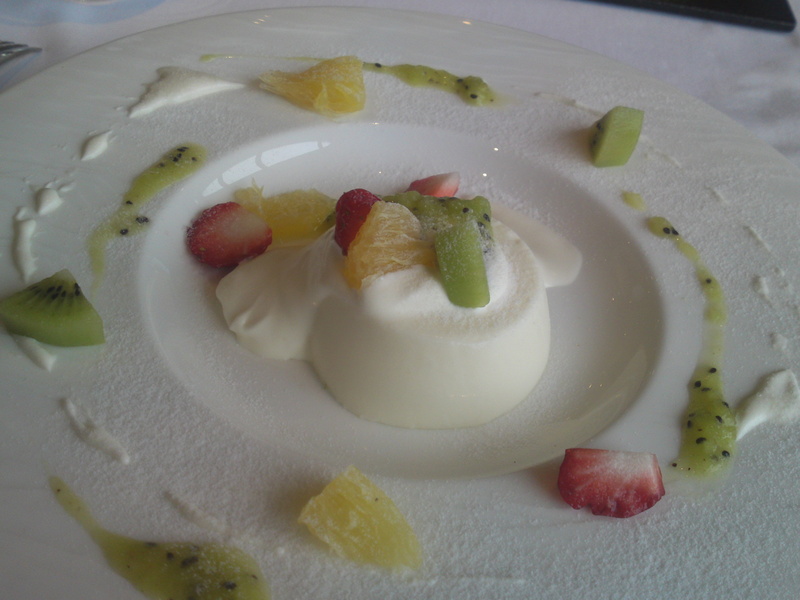 Blanc-manger made with Fujinishiki Brewery (Fujinomoiya City) premium daiginjyo sake white lees/sakekasu/酒粕 and kiwi fruit sauce! 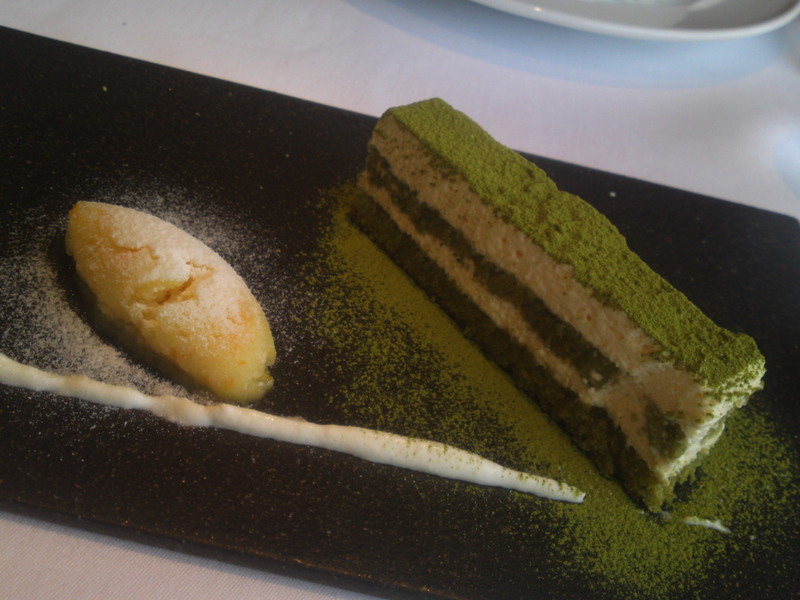 Shizuoka Matcha Tea Powder Mousse Cake and Kumquat Sorbet! 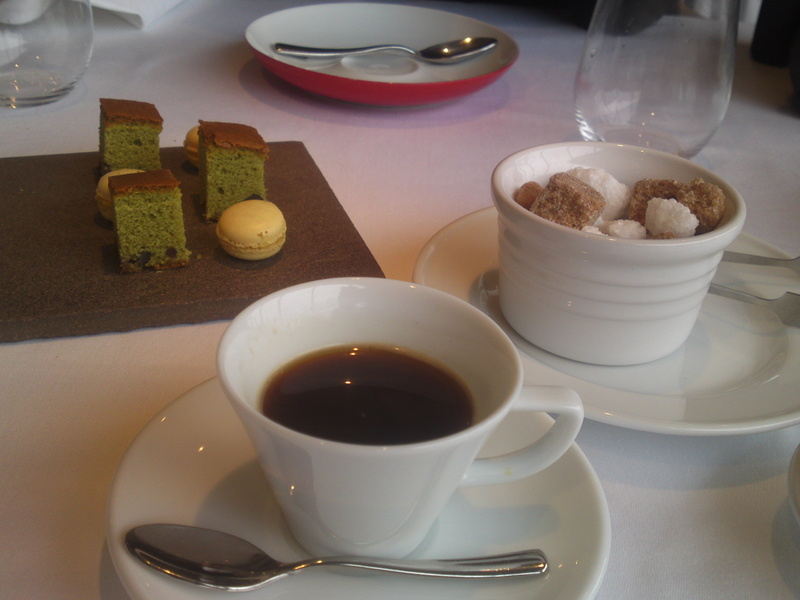 We just had enough space for the expresso, tea and mignardises! 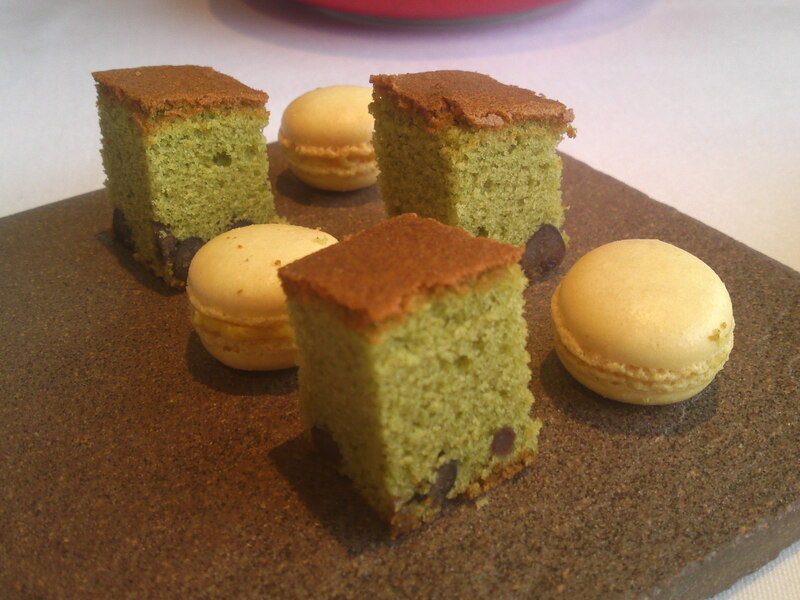 Matcha Castella with azuki beans and yuzu macarons! 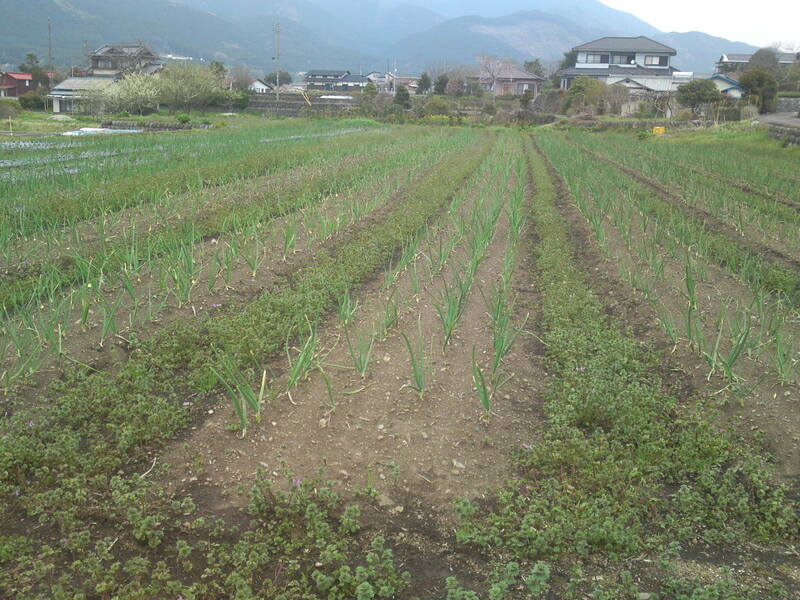 Before we left with Mr. Matsuki to interview Mr. Okamura in his ranch we had a small tour of the vegetables he grows for the pleasure of his customers! 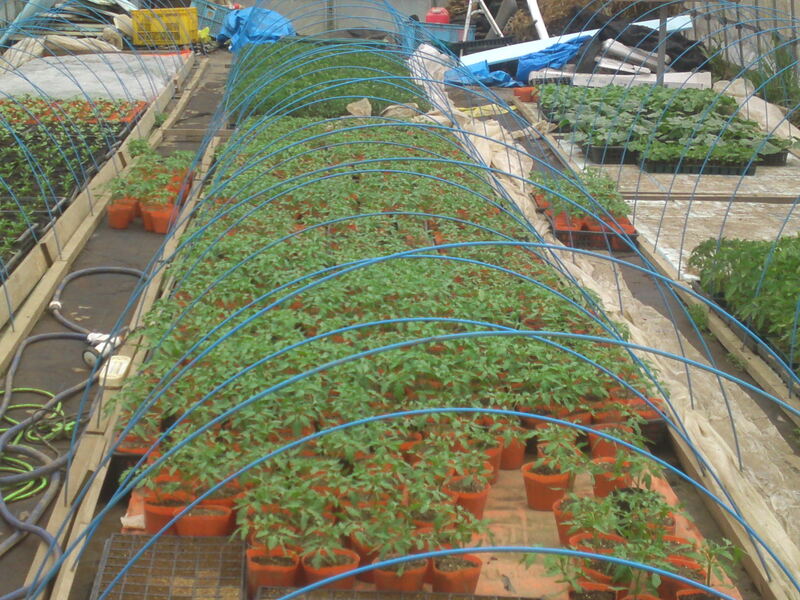 Carefully nursed before being re-planted! 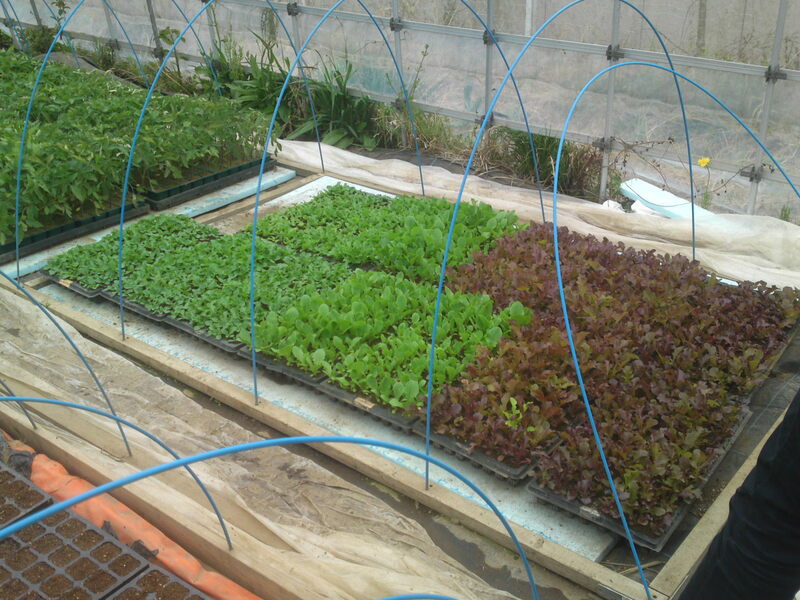 All lovingly cared for by Mr. Matsuki himself and his farm staff! 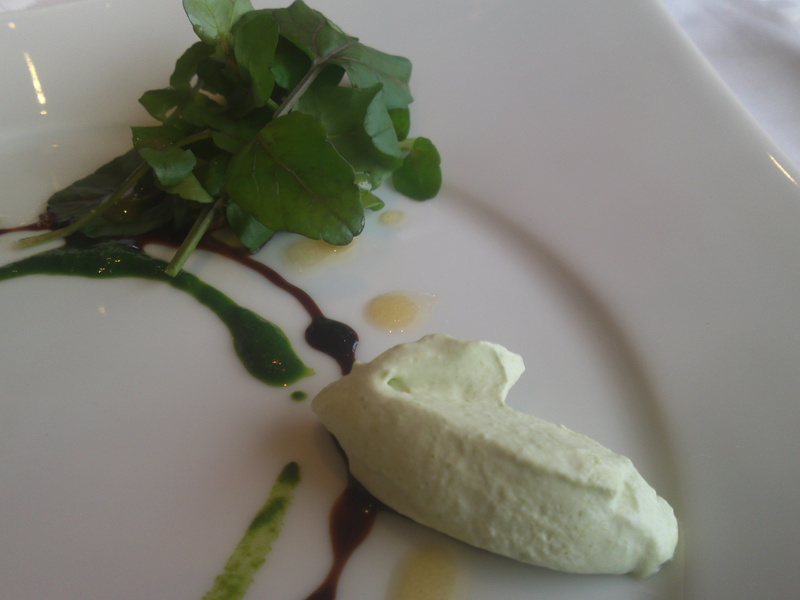 The restaurant makes a very large use of leafy vegetables! 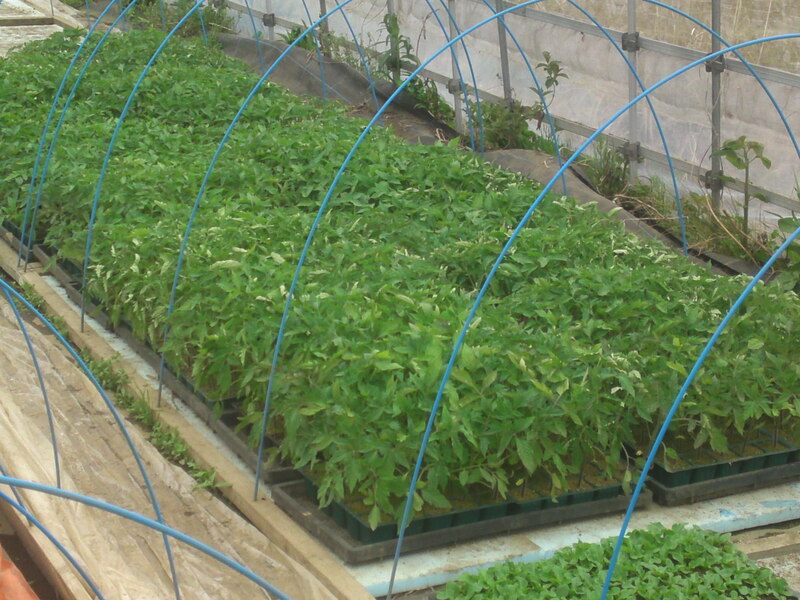 I surely intend to come back soon and have a closer look at all the farm plots! 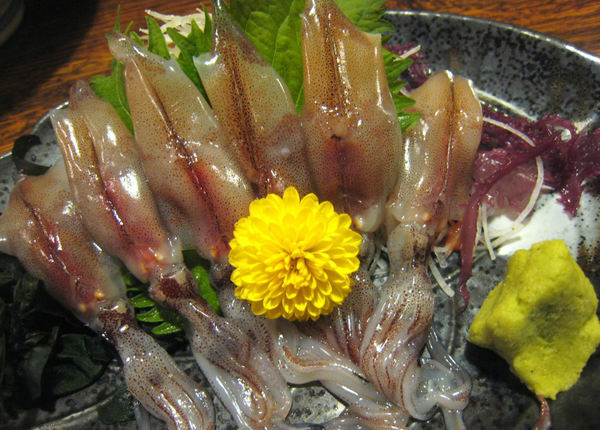 Very fresh Firefly squid can be appreciated as sashimi when very fres. 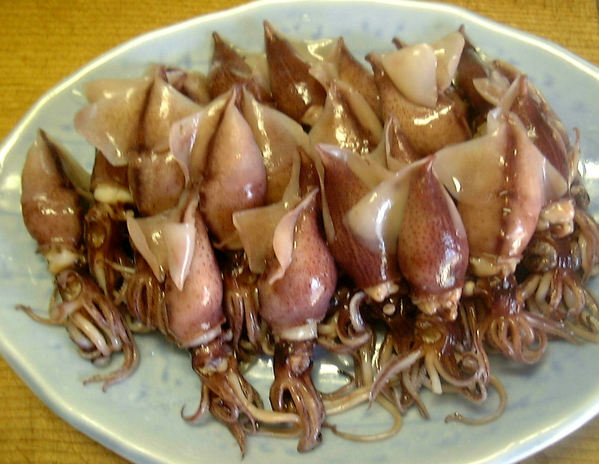 Boiled, they make for a great snack with bee! 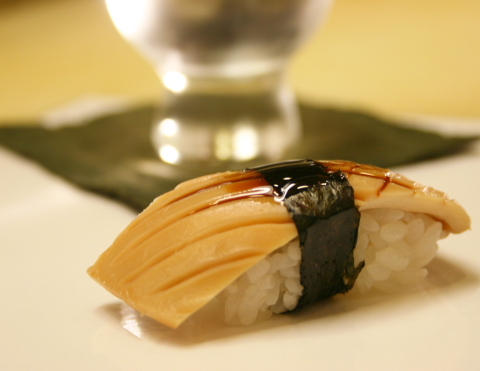 They are very cute served as nigiri sushi! 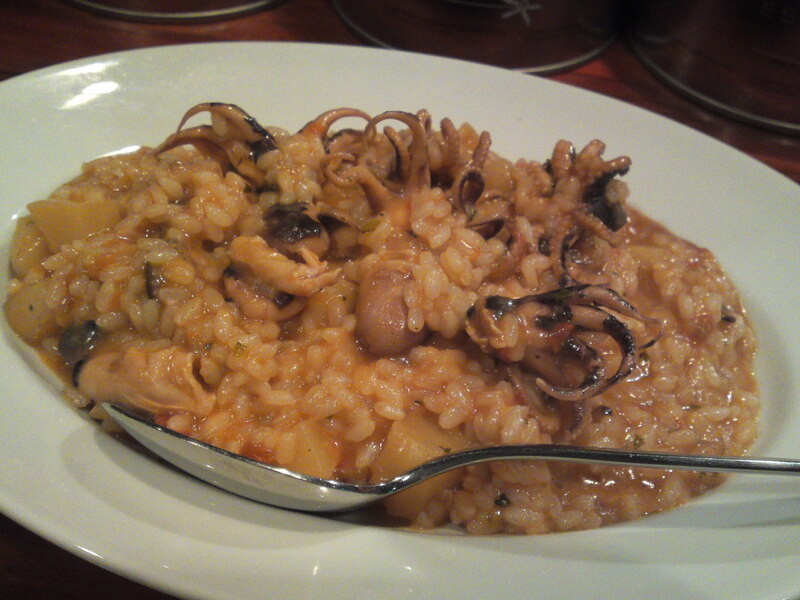 Italian restaurants in Japan often feature them in their menus! 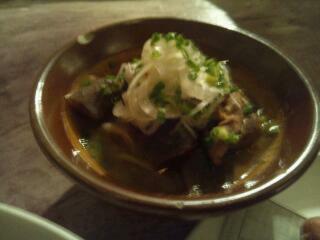 Izakaya: Table Ribbon in Shizuoka City! Facilities and equipment: Clean. Psychedelic Washroom! 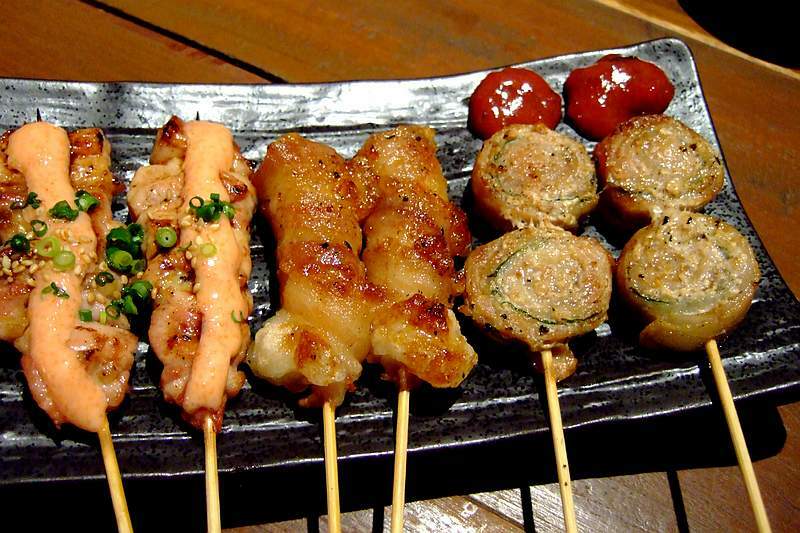 Strong points: Typical Japanese izakaya food and drinks for all ages. Open late. Sometimes (actually as often as possible) it is a good idea to take a break from the great restaurants in Shizuoka and to mingle with great easy and friendly customers and staff in a typical Japanese izakaya! There are loads of them in town and some open until really late! I have just discovered one which seems to be extremely popular with the locals of all ages, genders and classes: Table Ribbon! 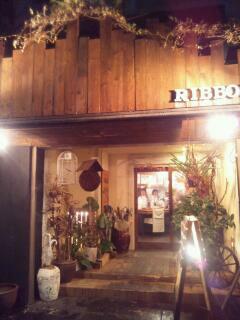 The whole place right from the entrance is a happy bric a brac from vinyl covered kitchen tables to rugs on the floor! You must visit the washroom! It is definitely crazy! 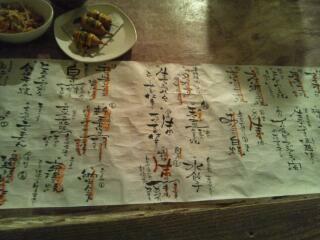 The whole menu is written in brush paint, but if you don’t understnad don’t worry you will be able to communicate! 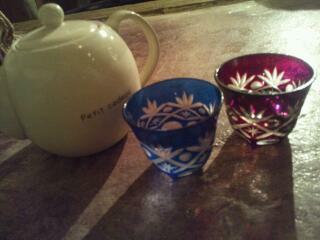 If you ask for room-temperature Japanese sake it is served in a tea pot! 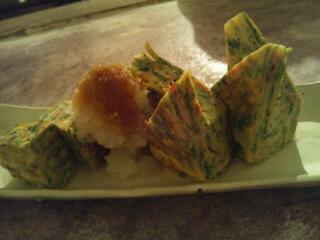 Great vegetable tamagoyaki! 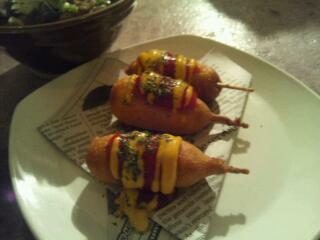 A must try! 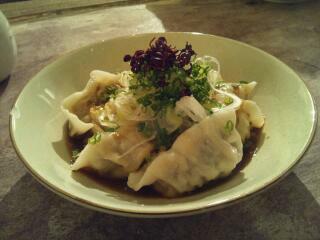 I loved their sui-gyoza/boiled gyoza! 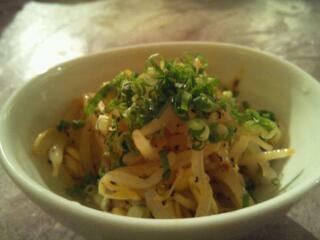 And of course Shizuoka-style yakisoba! It is a busy place! 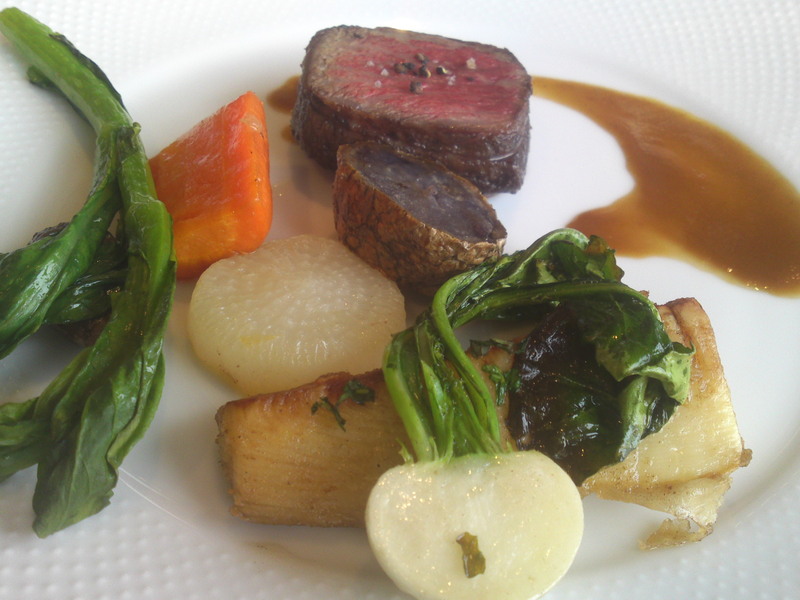 Make sure to reserve on week-ends! 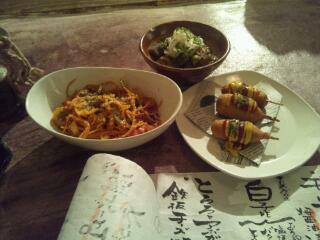 Great fun for ladies and gentleemn, Japanese and expats! 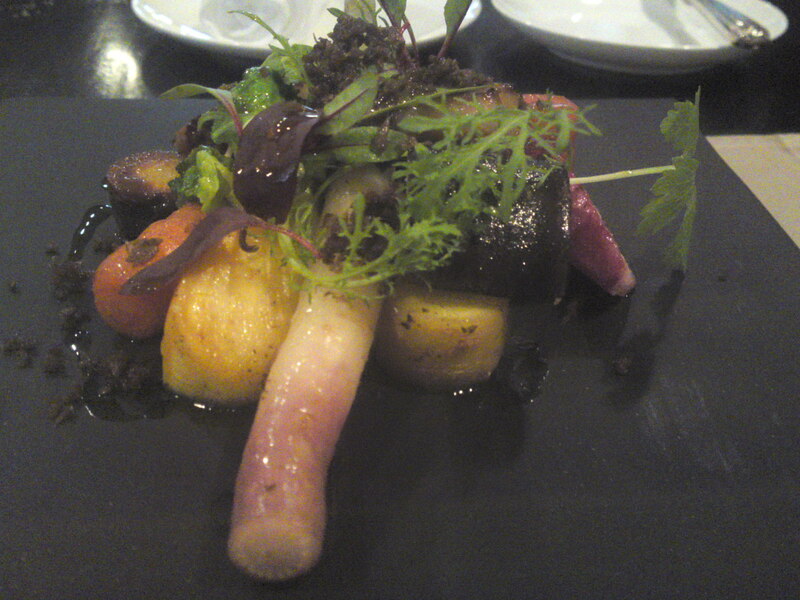 French Gastronomy Design: Tetsuya Sugimoto in Shizuoka City, Japan! 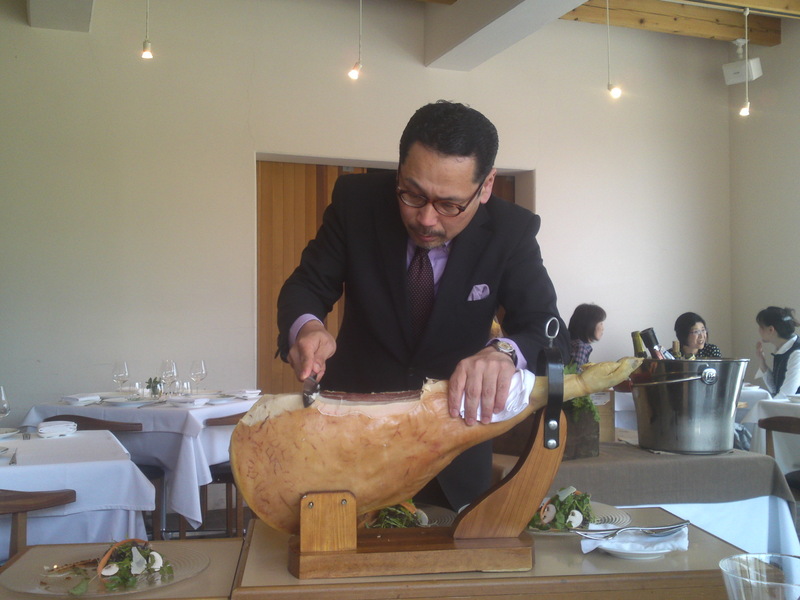 Tetsuya Sugimoto has gaine a highly respected name in French gastronomy and in gastronomy as a whole in Shizuoka Prefecture and far beyond our boundaries because he has always strived for local products, be they vegetables, meat, seafood or fruit by scouring the whole Prefecture for local producers and fishing harbors. 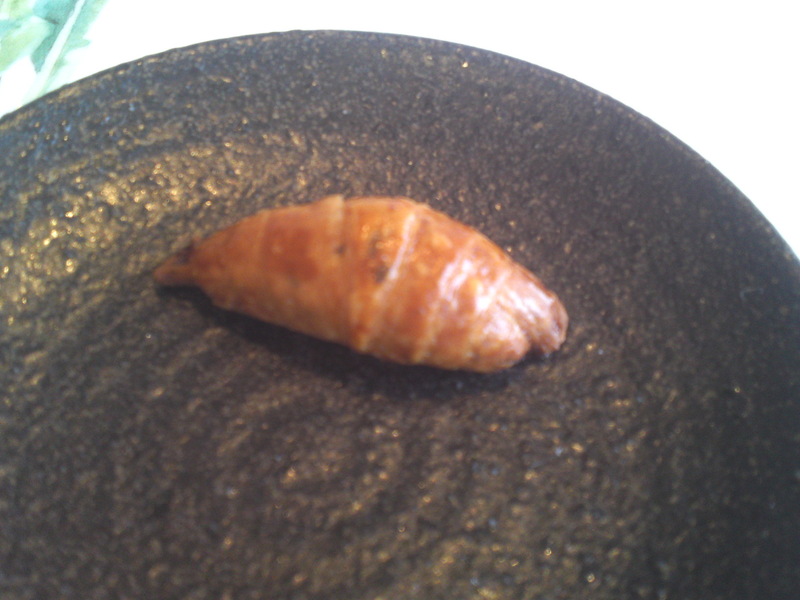 Even his sugar and salt are made in Shizuoka Prefecture! 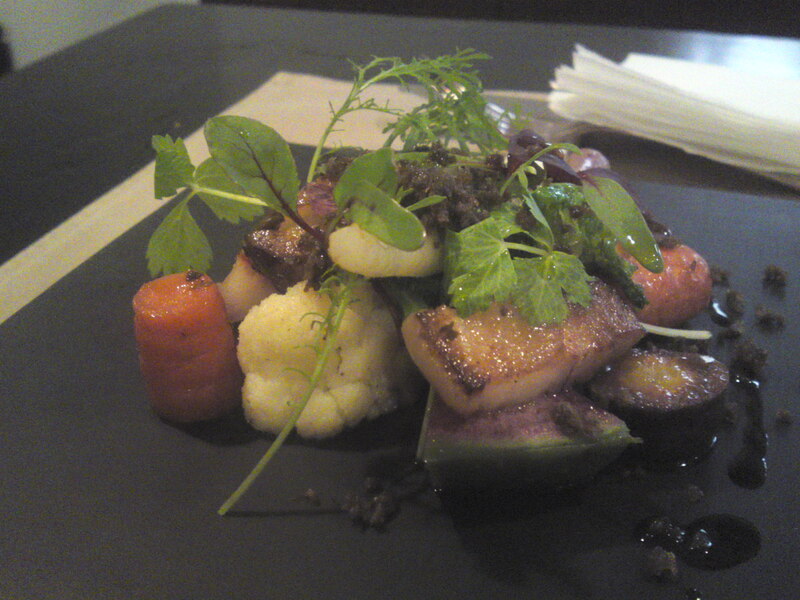 The vegetables and meat are directly delivered by farmers he has personally visited and the seafood arrives daily fresh caught in the morning. 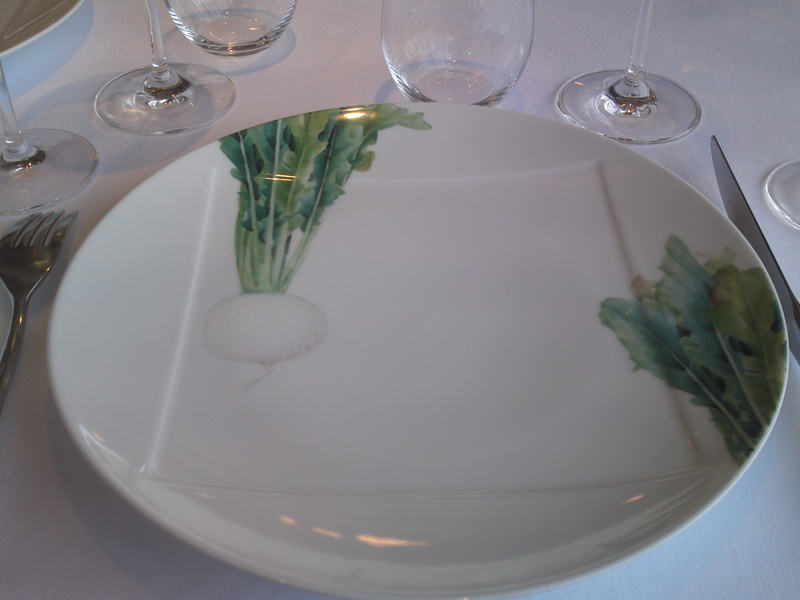 But what makes the real difference is his constant search for the ideal balance between design, marriage of flavors and simplicity which will encourage the visiting gastronomes to enjoy their food both in ease and awe! As an illustration let me introduce what I had the pleasure to enjoy on a horrible rainy day I completely forgot for a blissful moment! A little detail that makes the difference for the atmosphere! 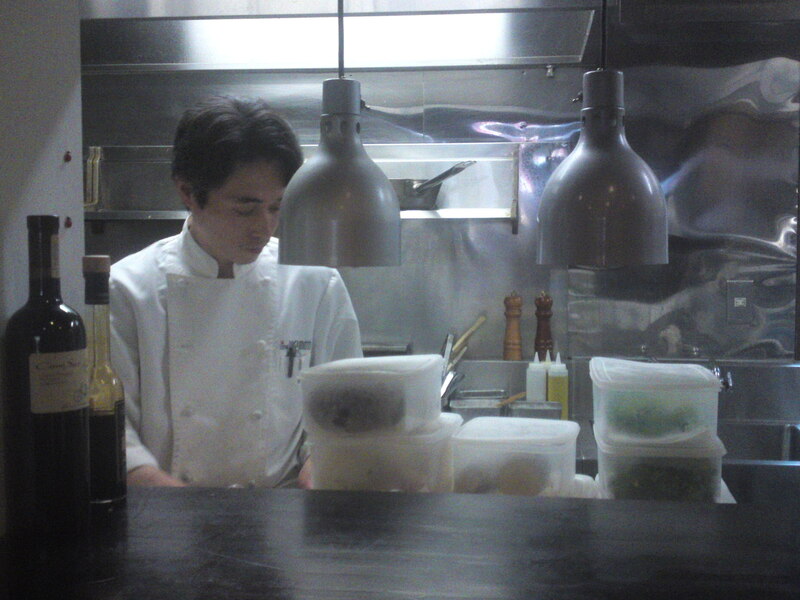 Testuya Sugimoto in his kitchen! 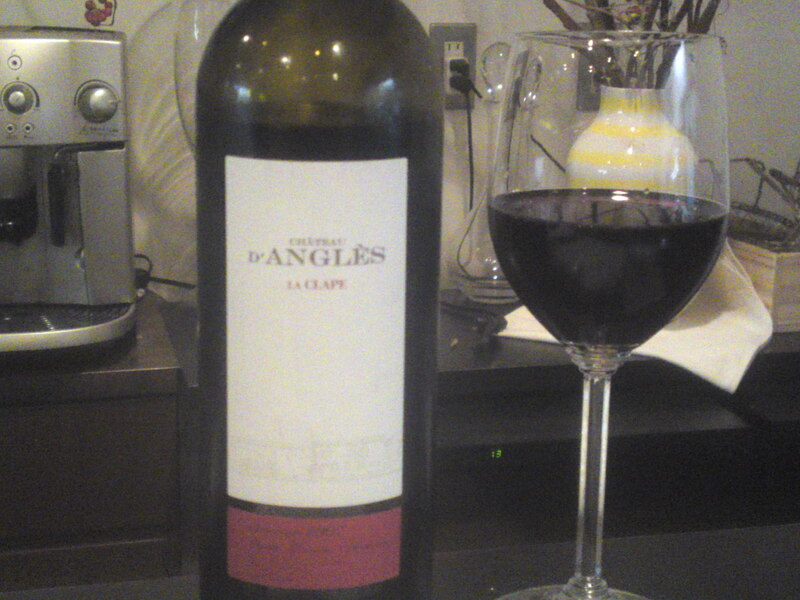 The wines are reasonable and well-chosen! 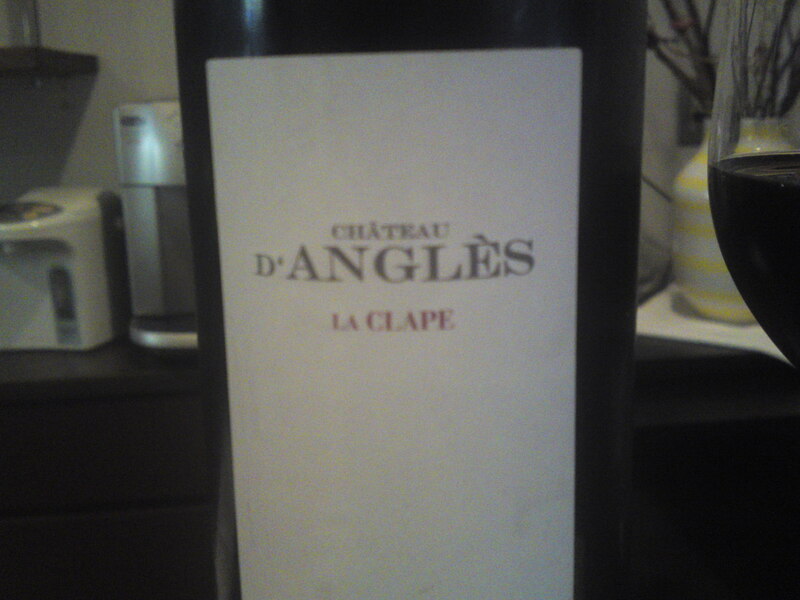 Chateau d’Angles, la Clappe in Languedoc, France. 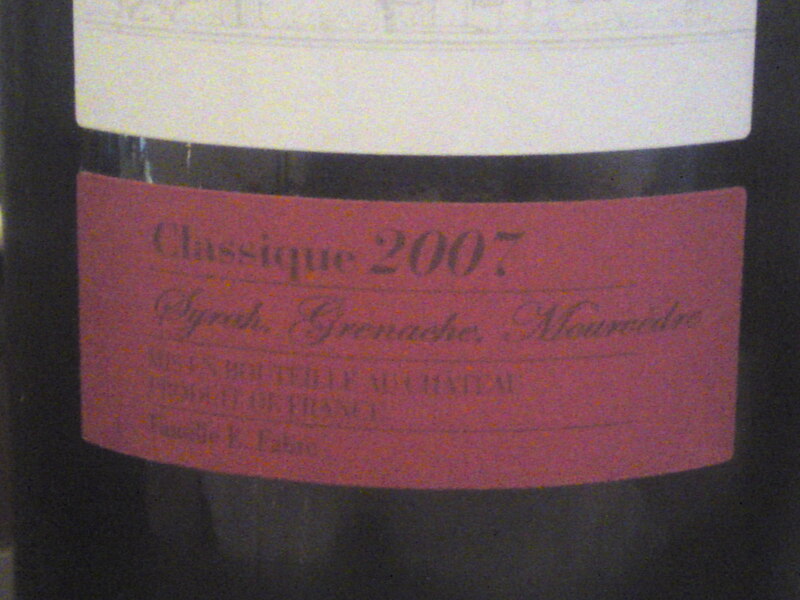 Created in 2007 with Shyrh, Grenache and Mourndre grapes. Very solid and reliable! 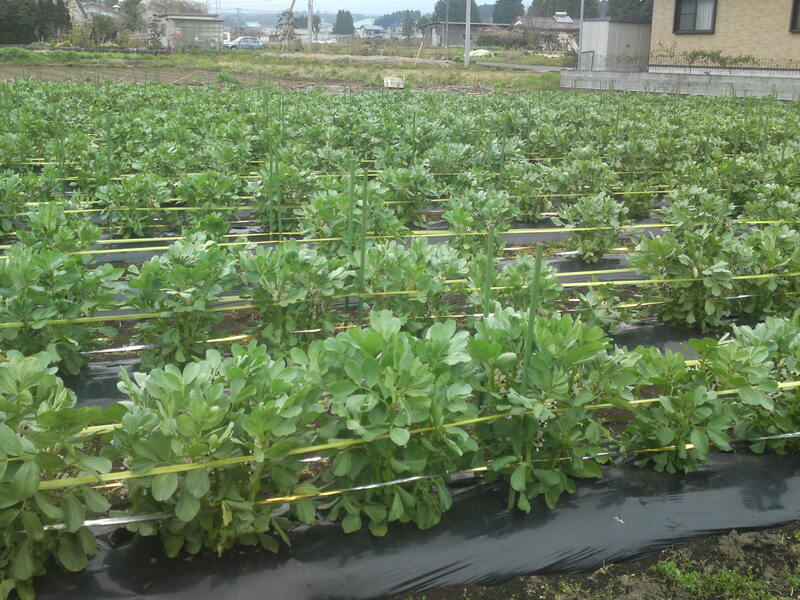 The vegetables for the first diash were organically grown by Mr. Kaneko in Hamamatsu City! 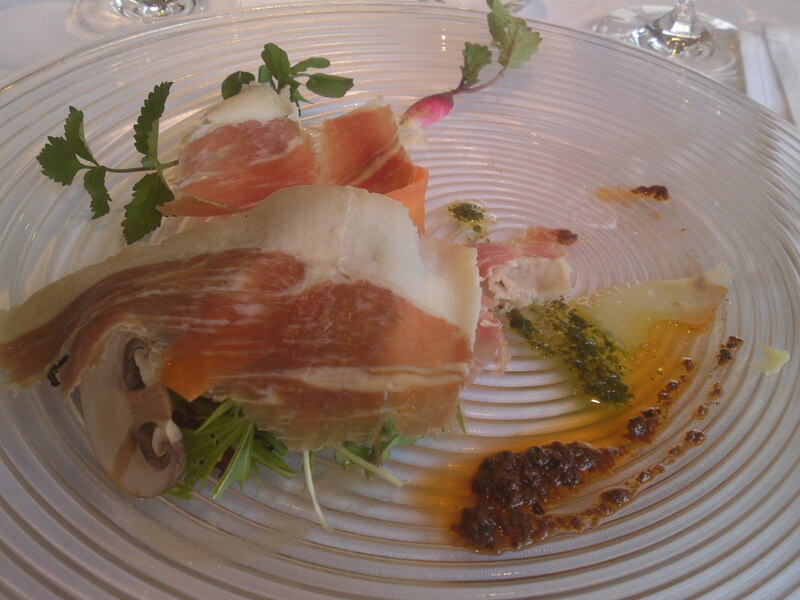 The top-class pork added for taste and sauce qas bred by Mr. Morishima in Hamamtsu City! 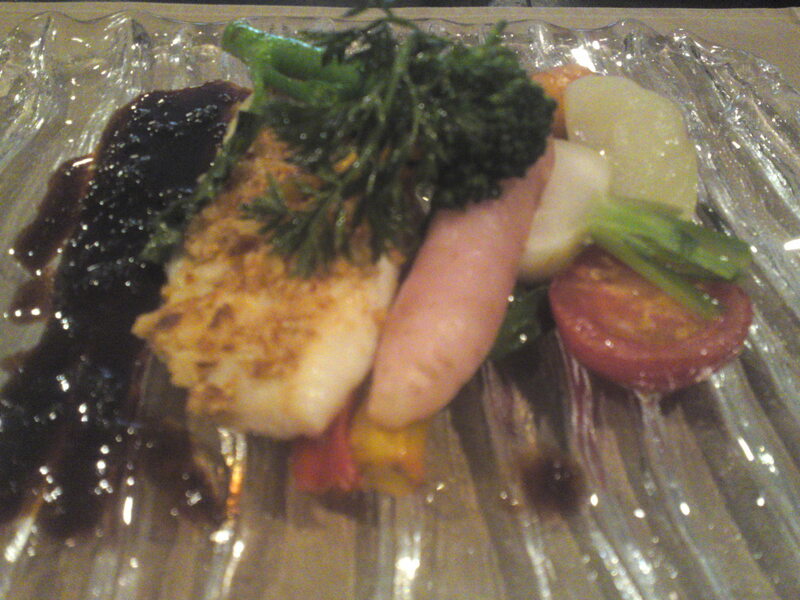 From another angle to understand the arrangement of seasoned fresh greens atop sauteed and baked vegetables. From another angle to dicover the beautifully sauteed/baked pork! 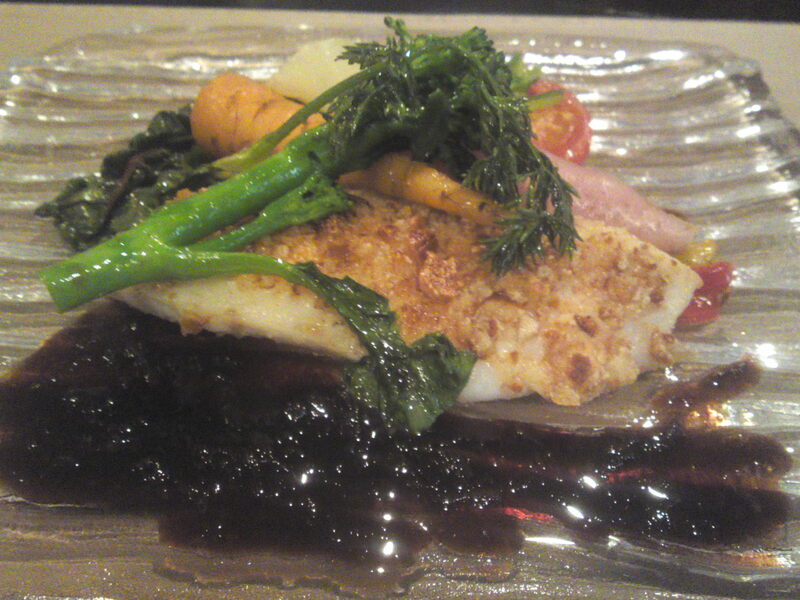 The fish was matodai/John Dory, St. Peter’s fish (English), Saint Pierre (French) caught off Mochimune harbor in Shizuoka City! 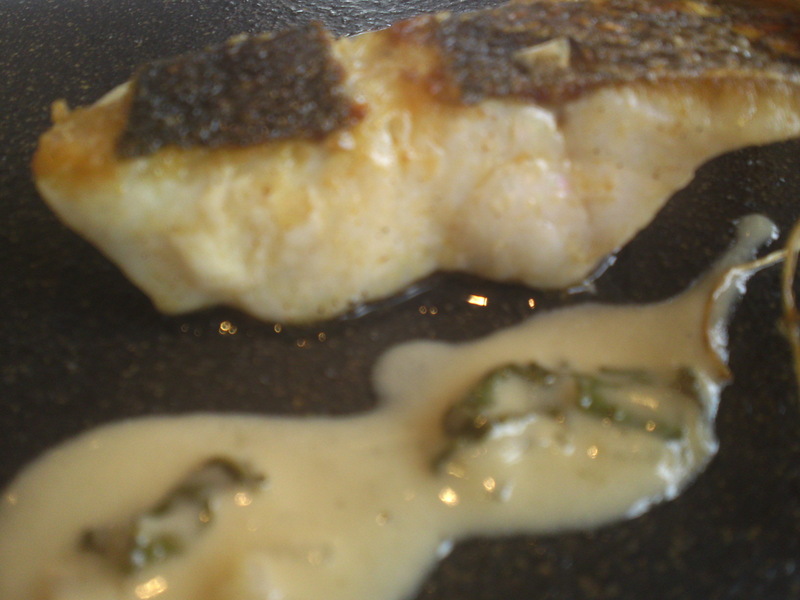 Pan-fried and oven -baked matodai with fukinoto/giant butterbur sauce! 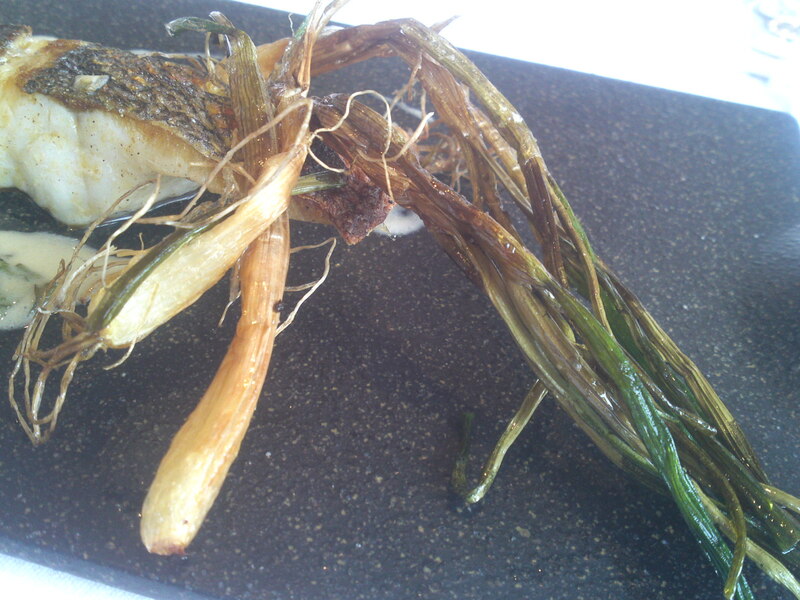 From another angle to understand the architecture of the dish! 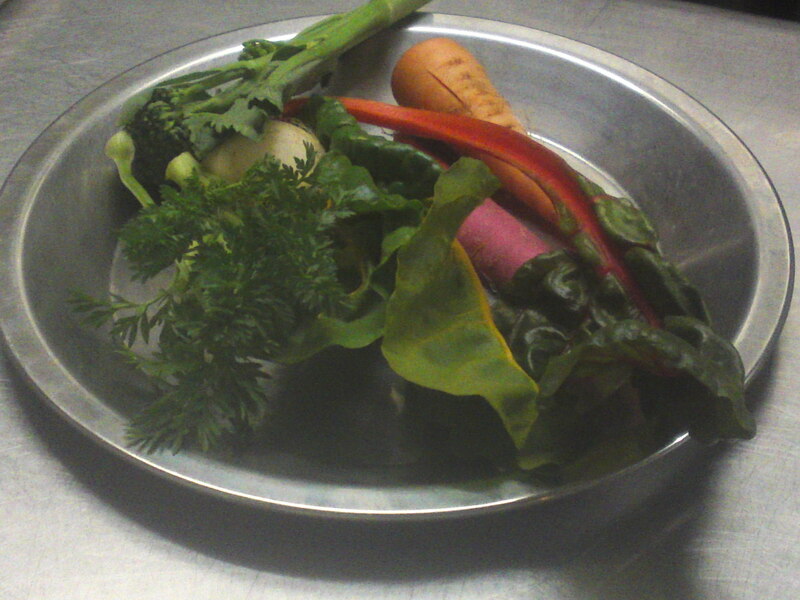 A rear view of the vegetables! 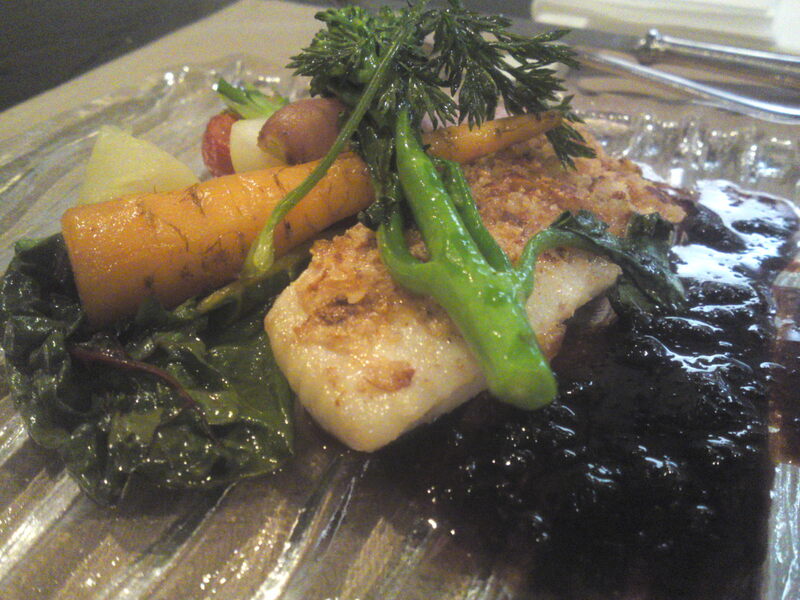 The crumbs covering the baked fish were made with crushed sembei made in Shizuoka City! 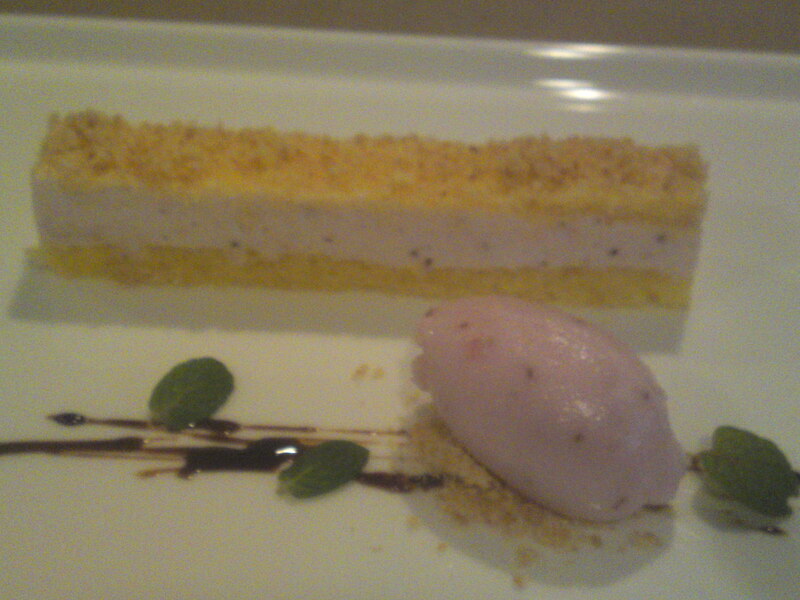 Now for dessert both the mousse and sorbet were made with organic Akihime strawberries from Shizen no Chikara Farm in Shizuoka City! The perfect and healthy dessert! 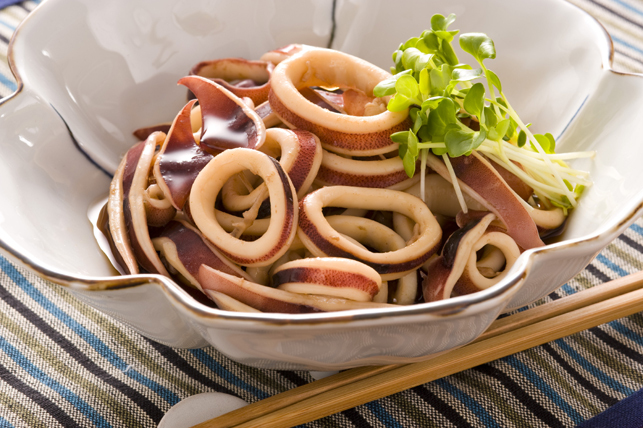 The Japanese squid can live anywhere in temperatures from 5° to 27°C, and tend to inhabit the upper layers of the ocean. 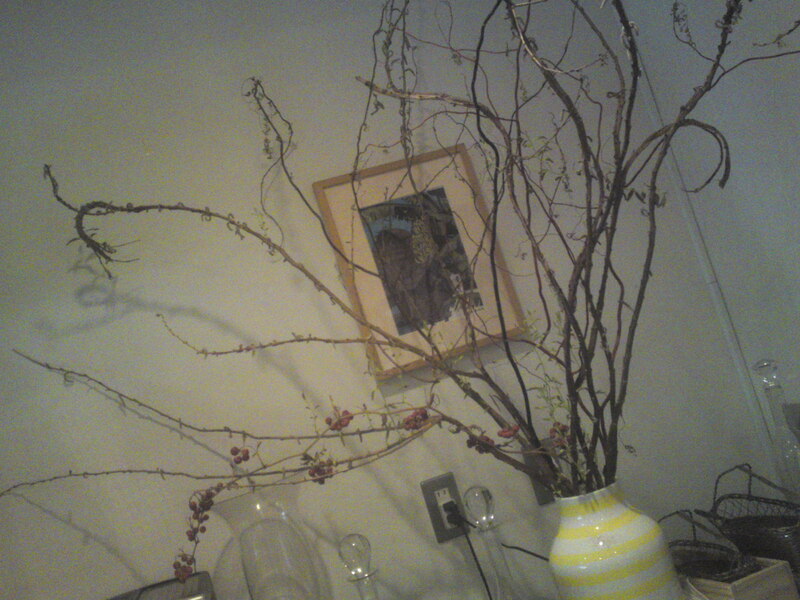 They are short lived, only surviving about a year. 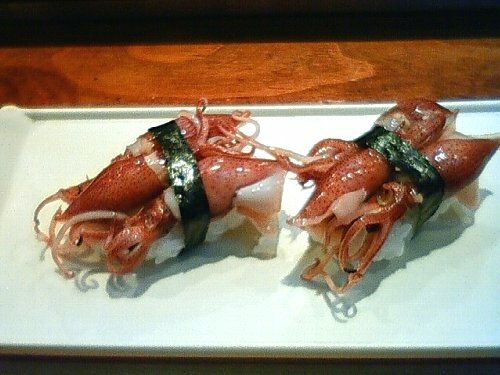 Flying squid have been observed to cover distances as long as 50 meters above the surface of the water, presumably to avoid predators or save energy as they migrate across vast expanses of ocean, uniquely utilizing jet-propelled aerial locomotion. 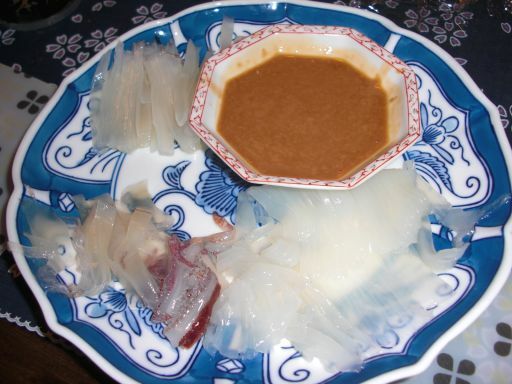 When very fresh it can be enjoyed as sashimi, especially with a niso or sesame dressing-based dipping sauce! 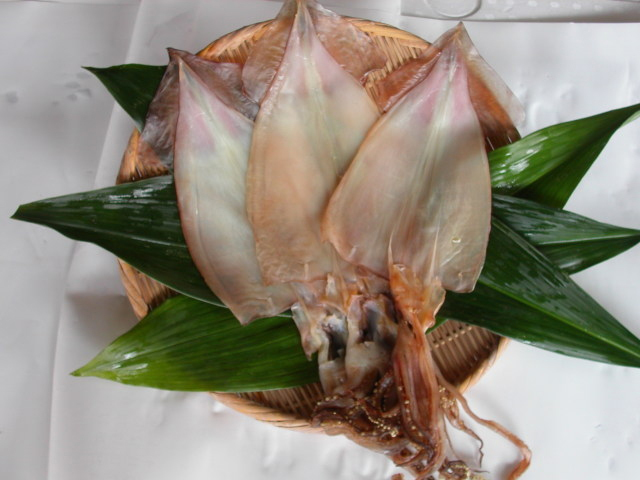 Dried surume ika! Greta with beer or sake! 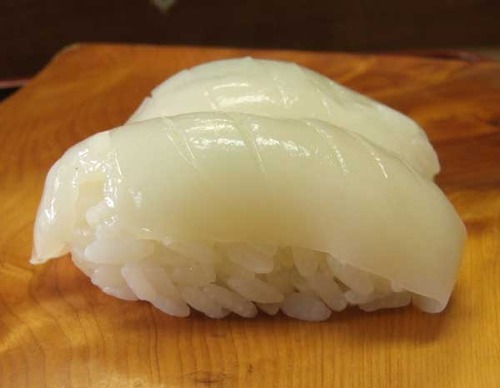 Also a great snack when boiled or grilled! 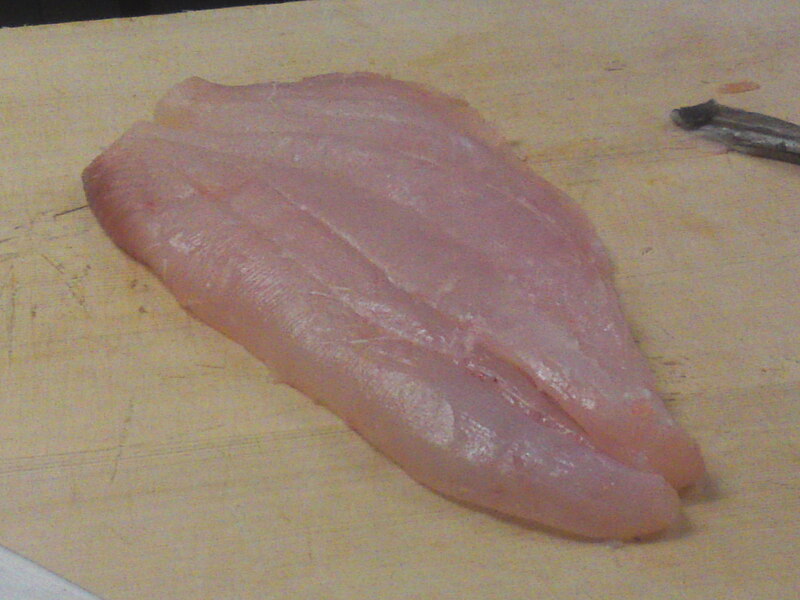 Fresh specimens ought also to be samples as sushi nigiri! 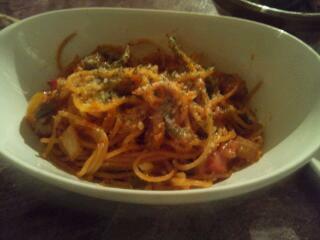 The same simmered and seasoned with tare sauce!